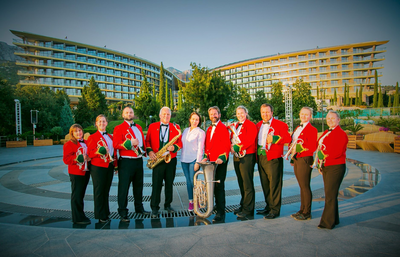 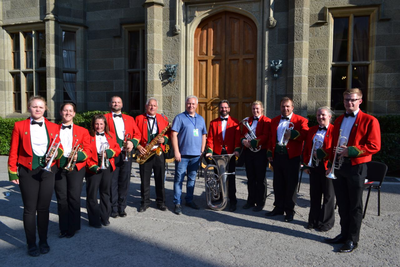 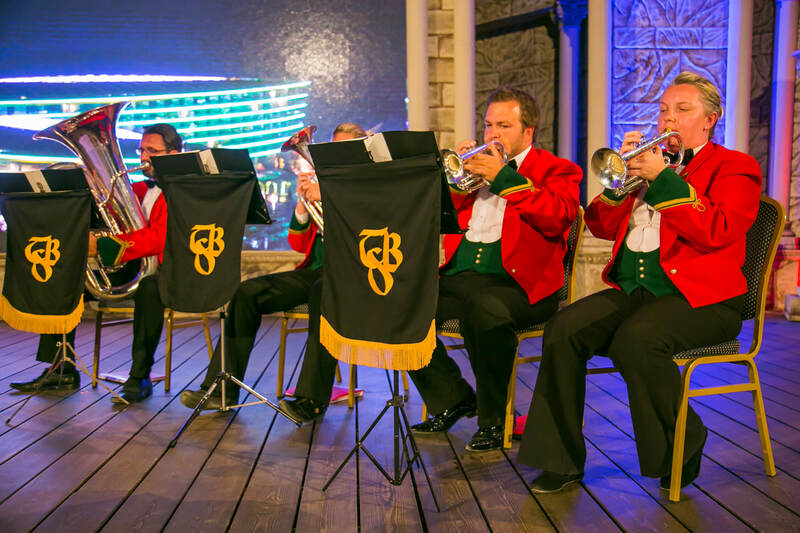 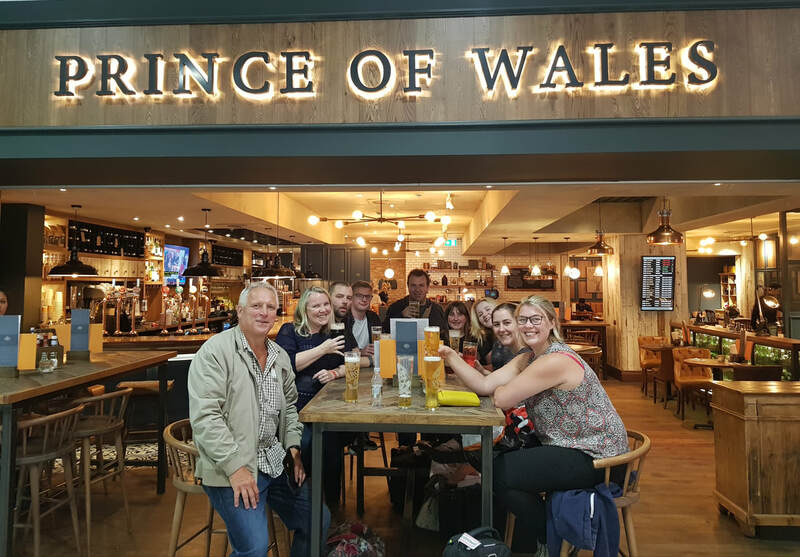 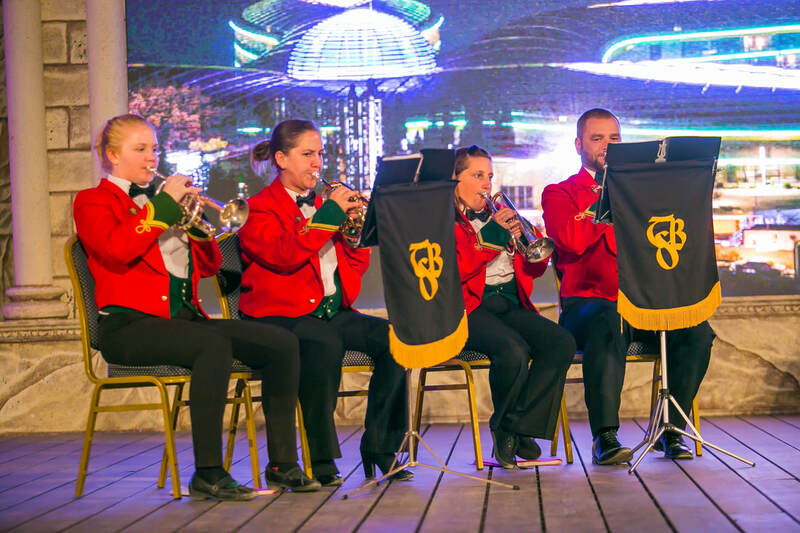 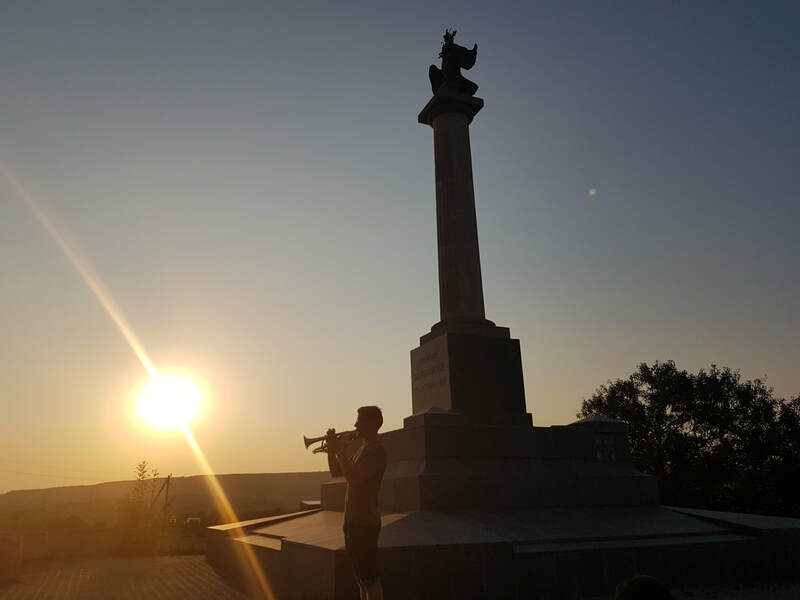 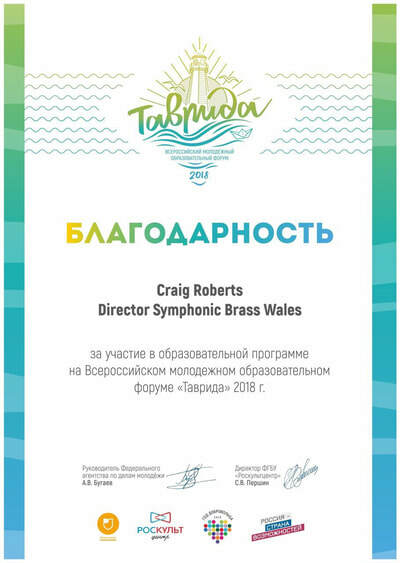 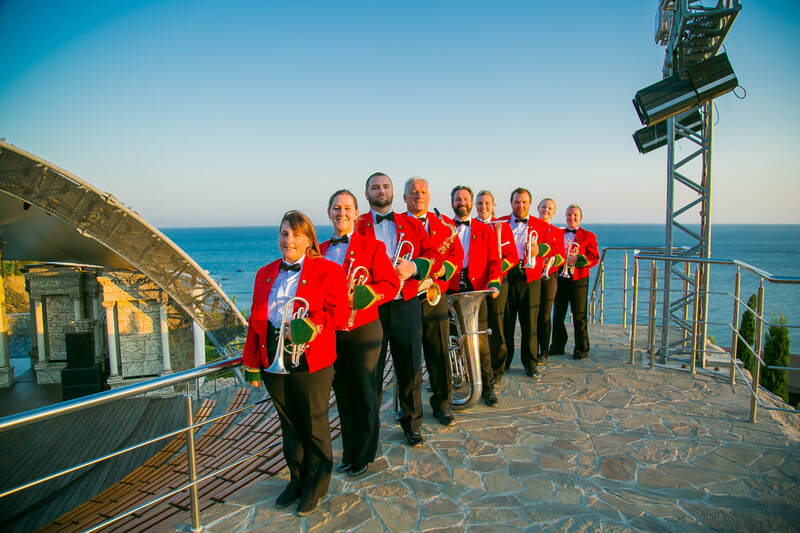 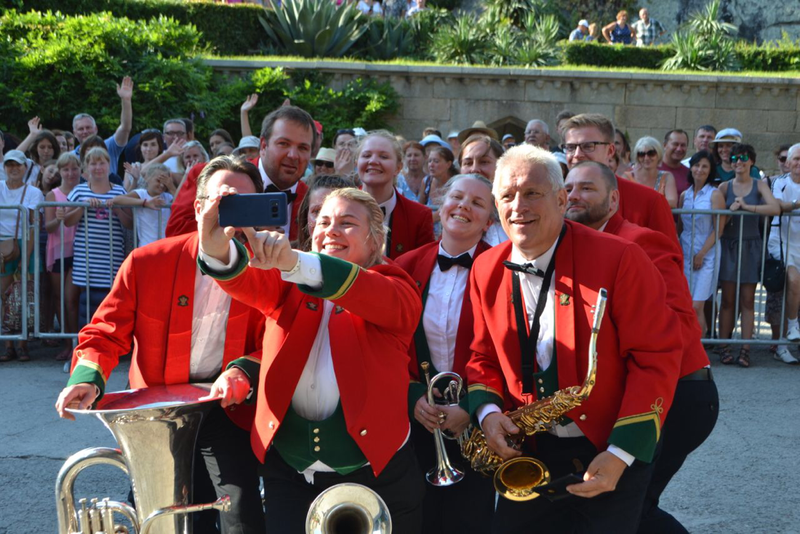 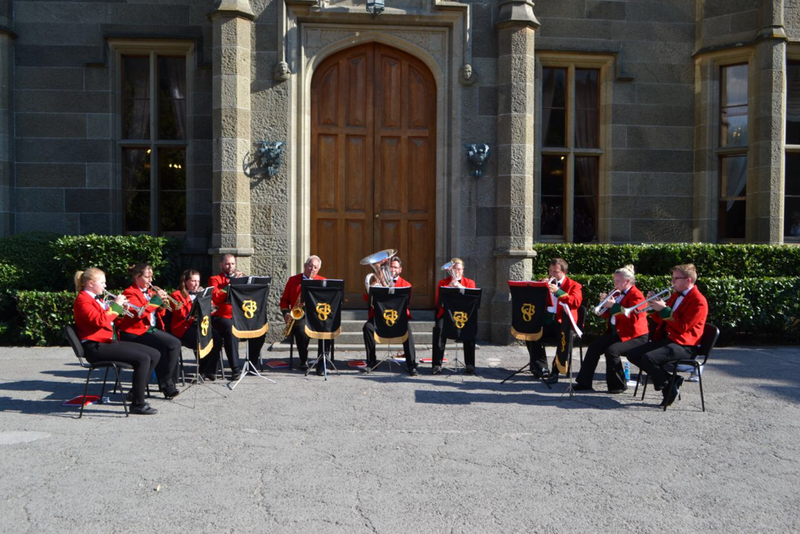 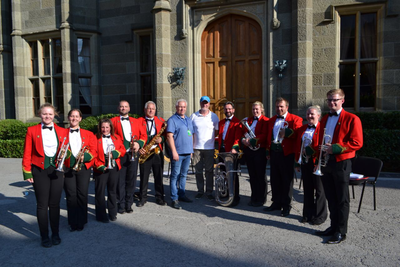 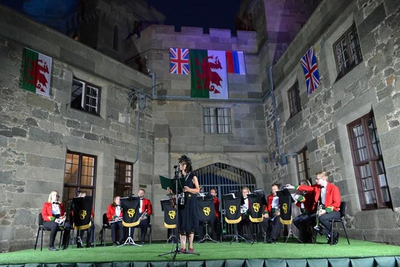 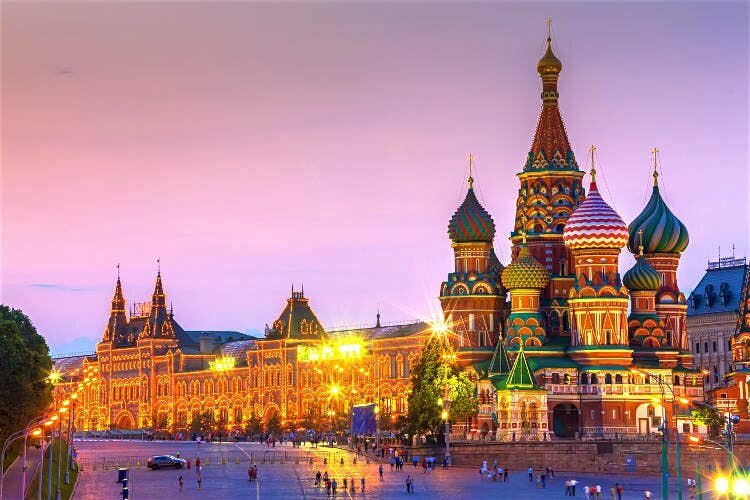 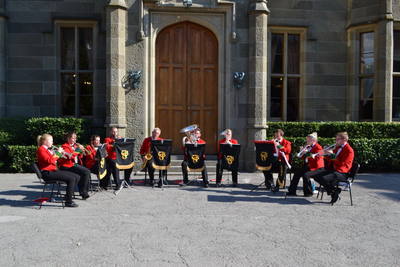 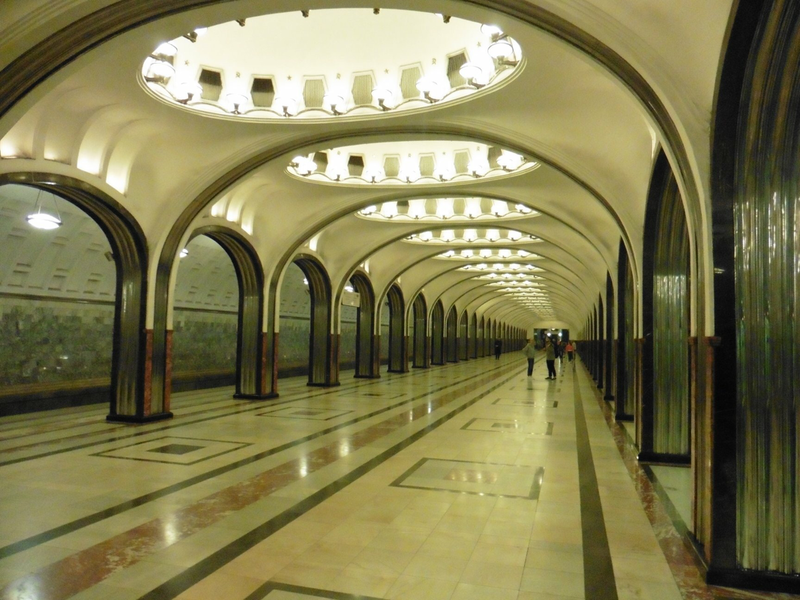 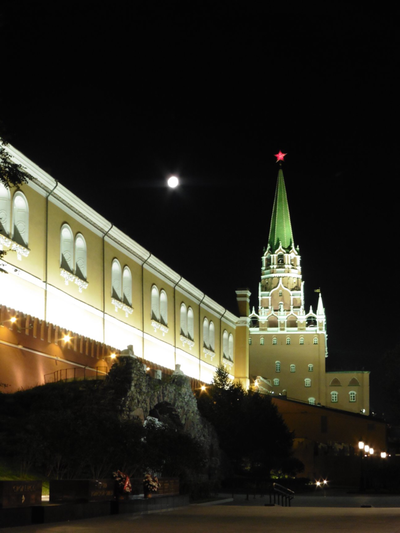 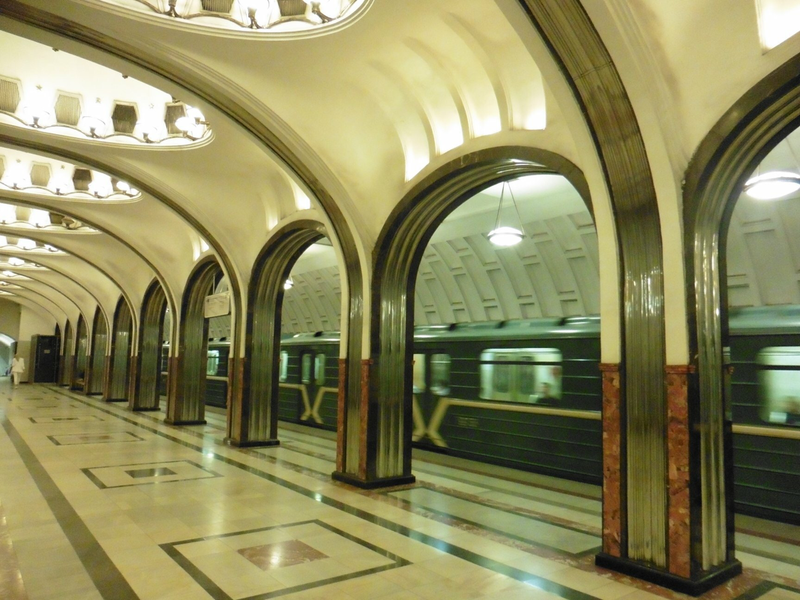 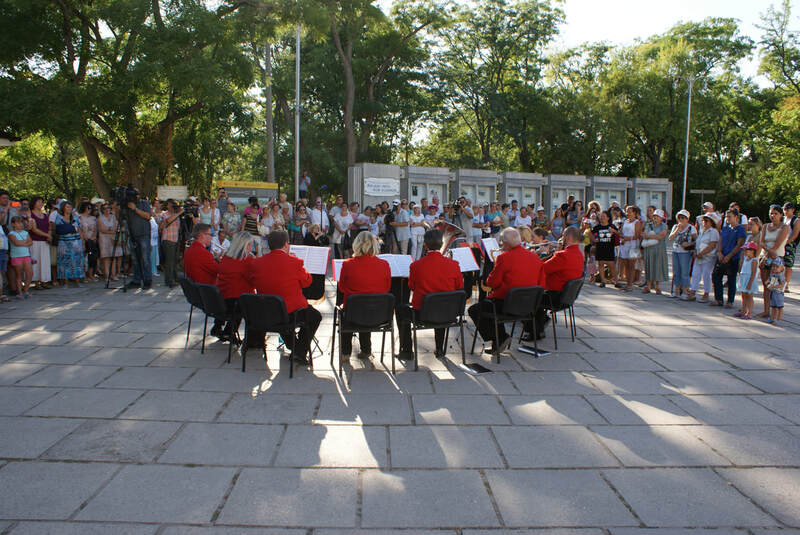 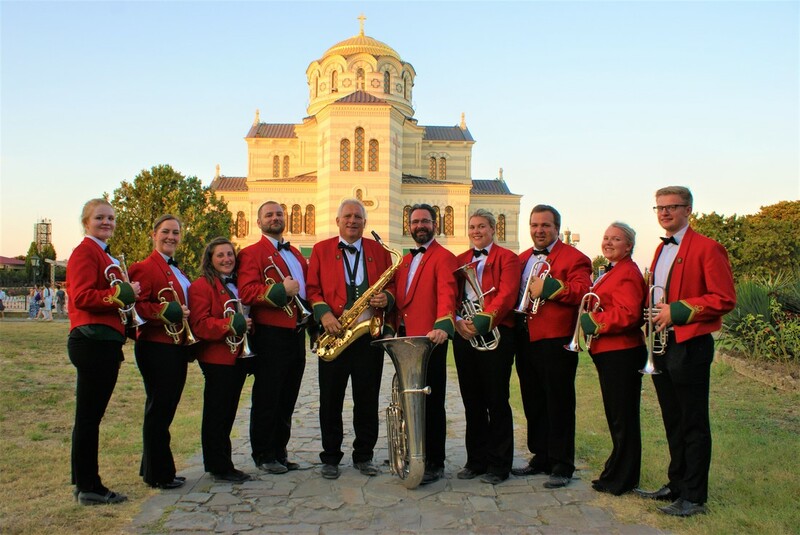 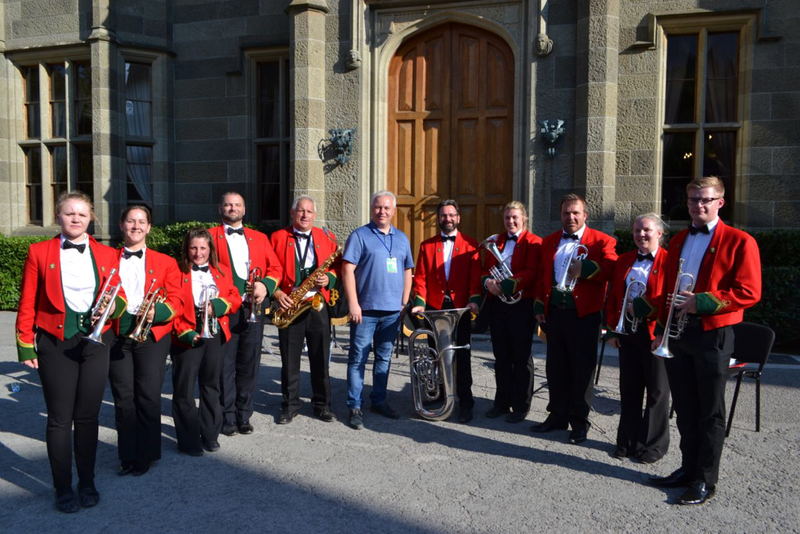 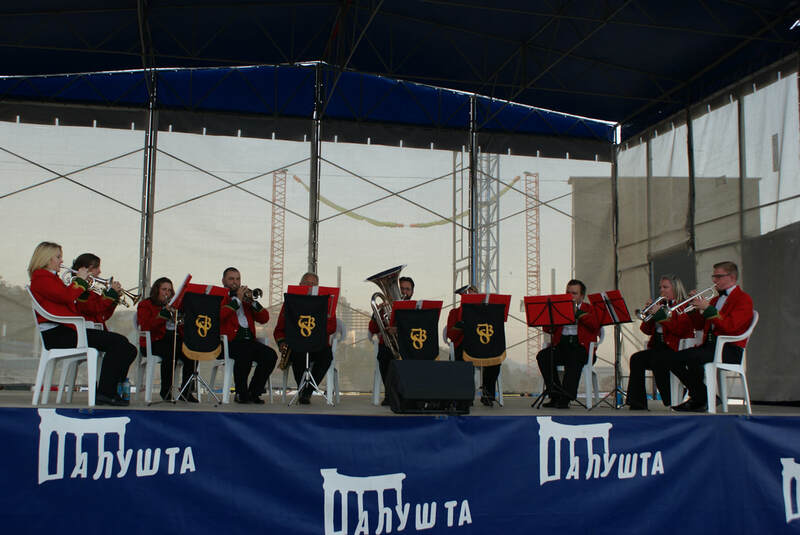 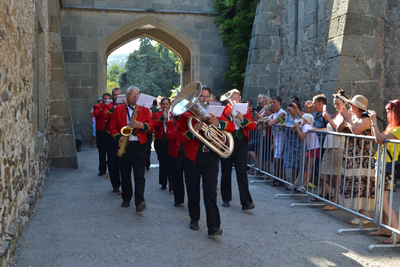 Following our performance at the prestigious Victory Day celebrations in Moscow, Russia in May 2017, Symphonic Brass Wales were subsequently invited to perform in Russia once again from August 13th to 25th 2018, visiting Moscow, Krasnodar and Crimea. 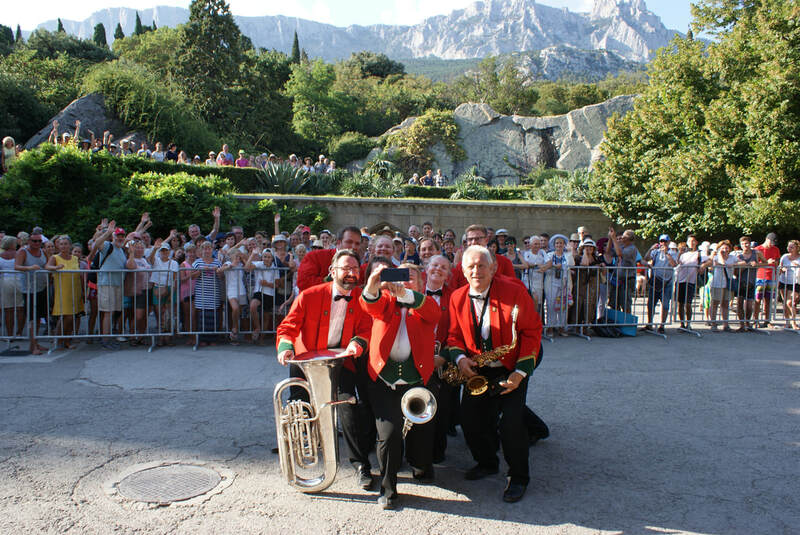 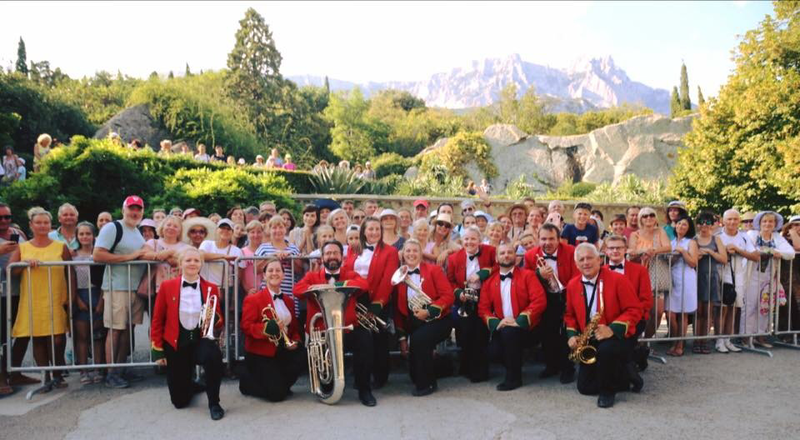 The tour follows on from previous visits by performing groups from Italy & New Zealand to the region in March, and indeed the famed New Orleans Rebirth Brass Band from the USA who were performing at the Koktebel Jazz Festival during the same period as our own visit. 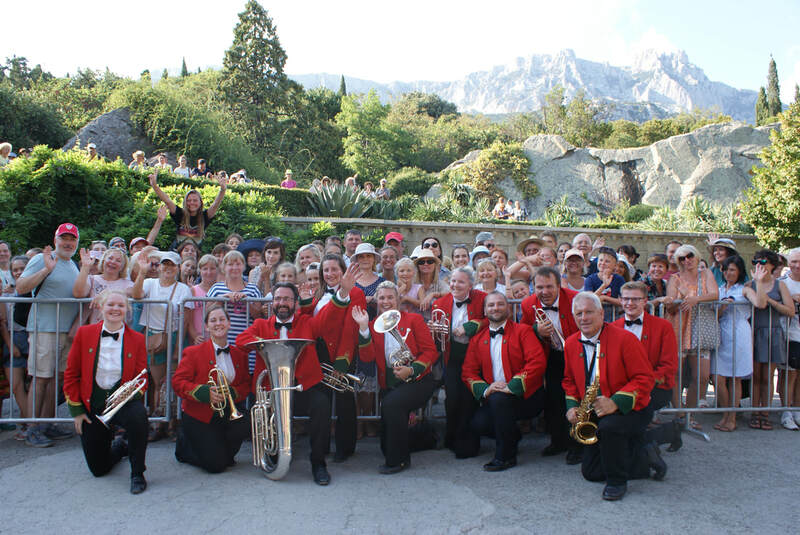 Videos from the Italian and New Zealand visits can be found at the bottom of the page below. 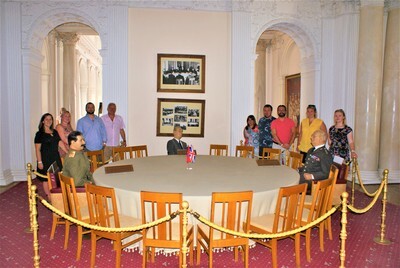 Our own visit was tremendous. 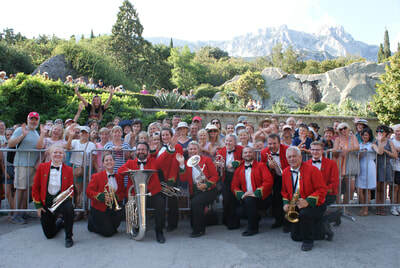 We had an absolutely fantastic time in each of the regions and cities that we visited, and received a tremendous welcome from the local people in each. 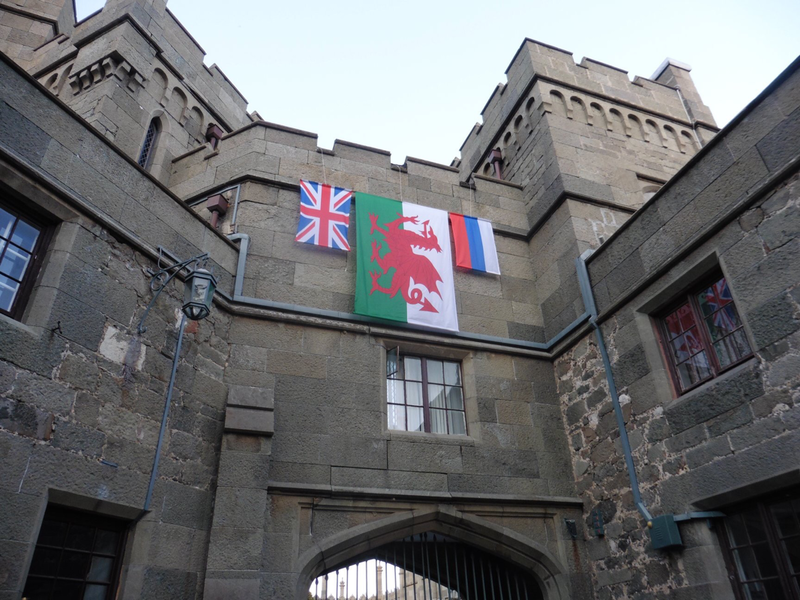 Our huge thanks goes out to all our incredible audiences, hosts and all the wonderful people we met during our visit - Diolch yn fawr iawn - большое спасибо. We hope to visit the region again sometime in the future. 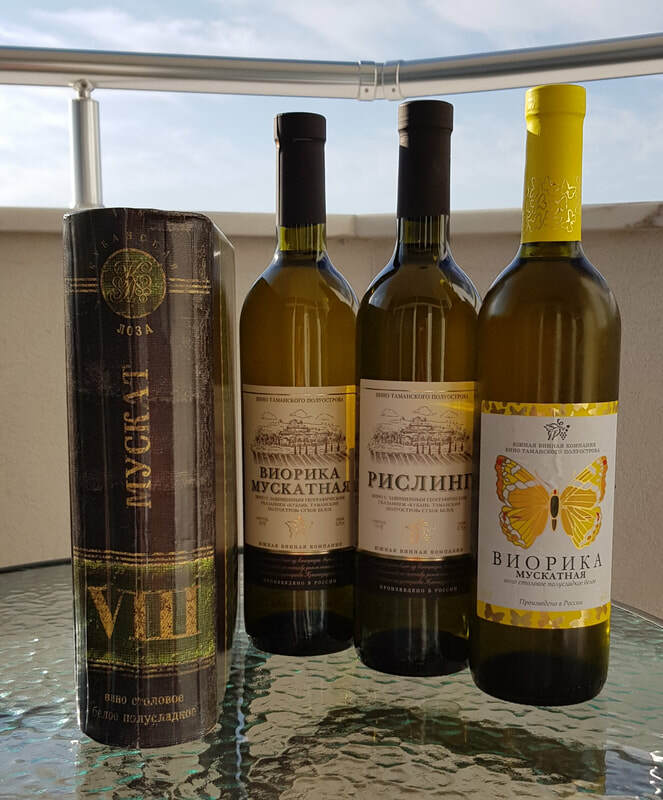 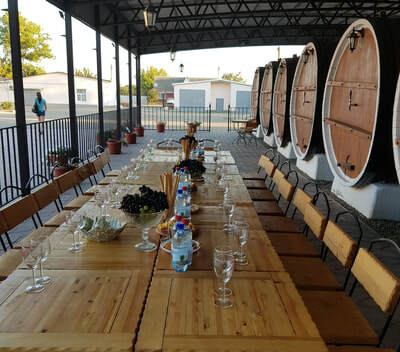 At Krasnodar we visited the South Taman Wine Company in the Kuban Cossack region. 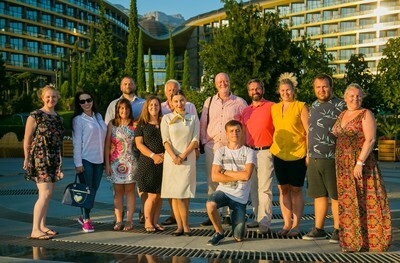 We enjoyed tremendous hospitality from our hosts there. 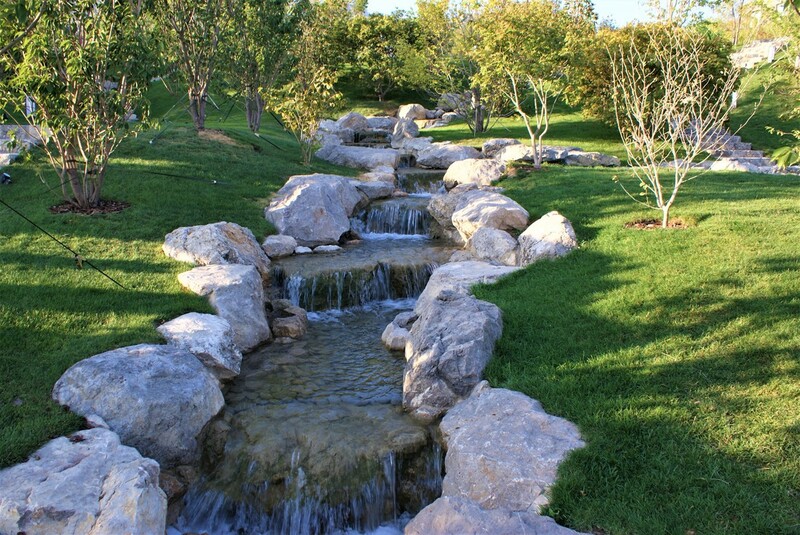 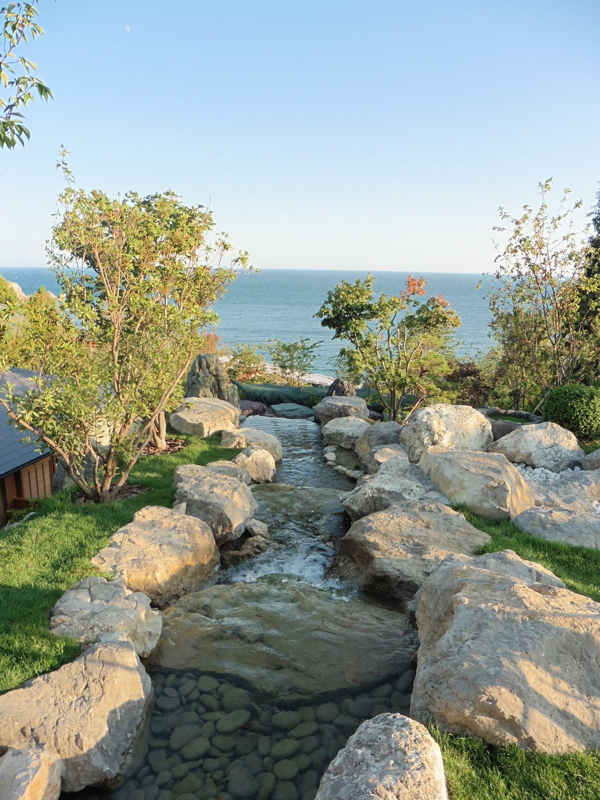 The vineyard's facilities include wine fountains, baths and even showers! 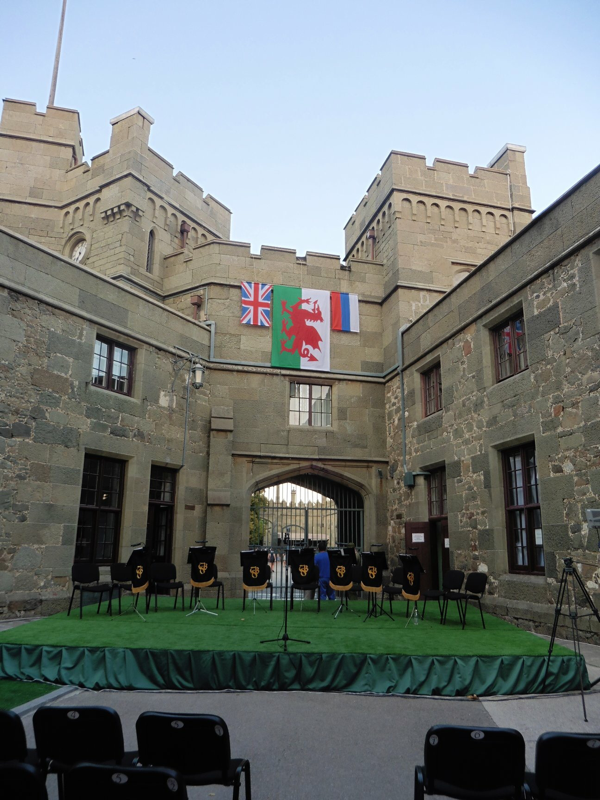 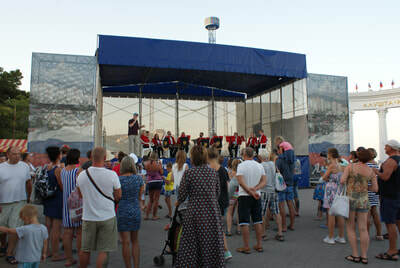 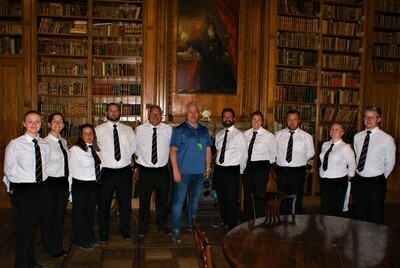 We sang traditional songs in both Russian and Welsh and visited the excellent vineyard store before departure. 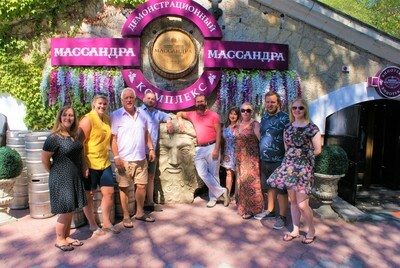 Our hosts presented us with an icon of St Nicholas as a memory of our visit. 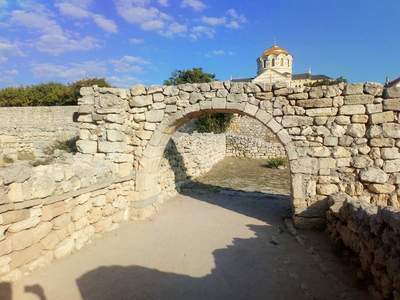 Chersonesus is an ancient city located on the shore of the Black Sea at the outskirts of Sevastopol. 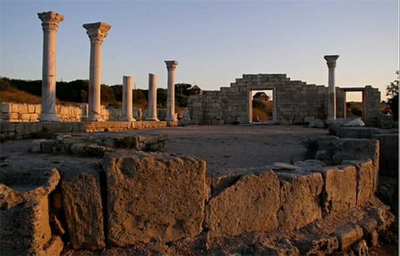 The colony was established c.2500 years ago in the 6th century BC by settlers from Heraclea Pontica. 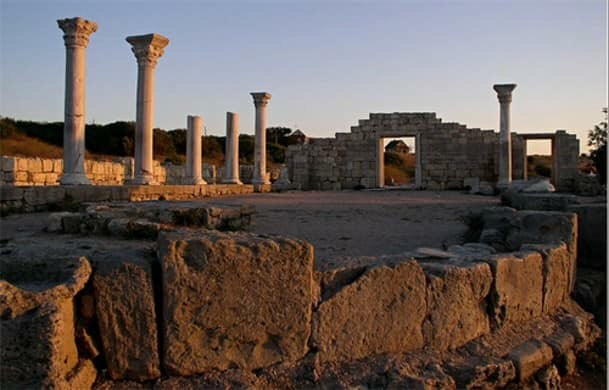 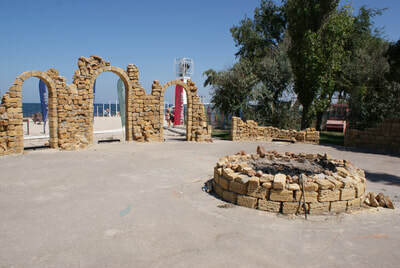 Chersonesus is an important UNESCO World Heritage site, where extensive archaeological excavation is now being undertaken. 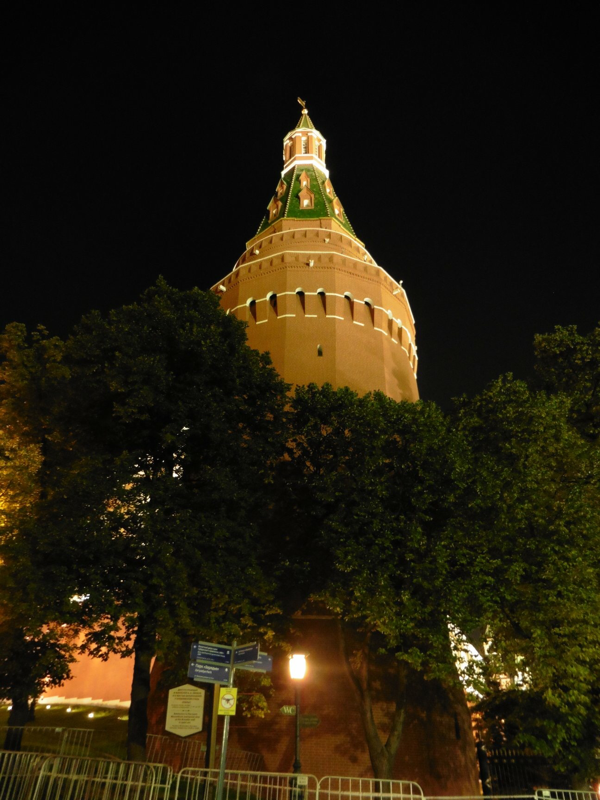 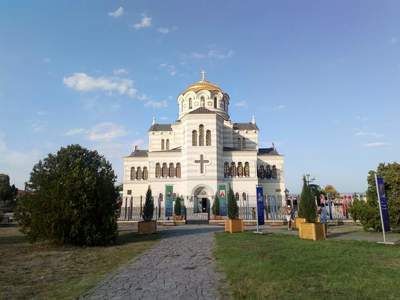 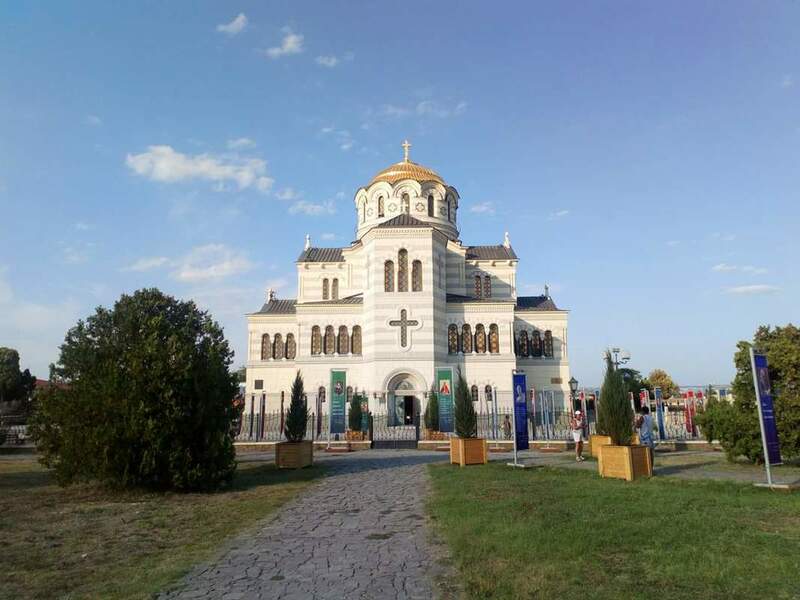 The site also features the Cathedral of St Vladimir (the "birthplace of Christianity in Russia") and the iconic Bell of Chersonesus. 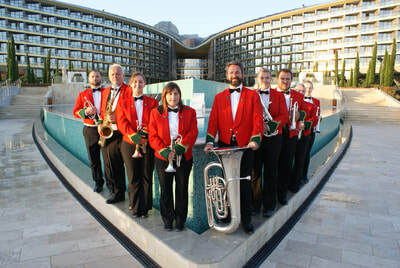 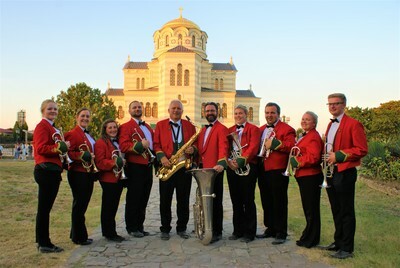 The ensemble are pictured below at both. 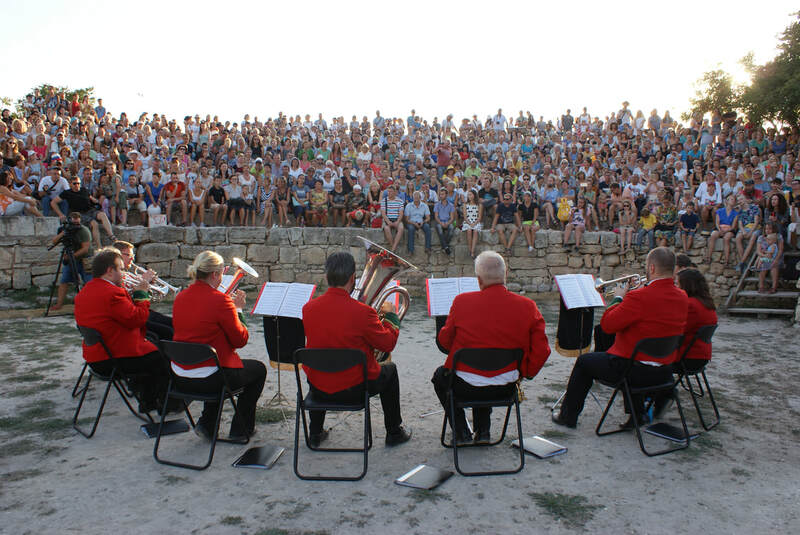 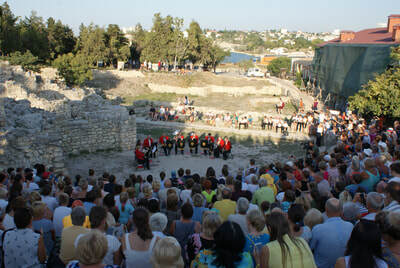 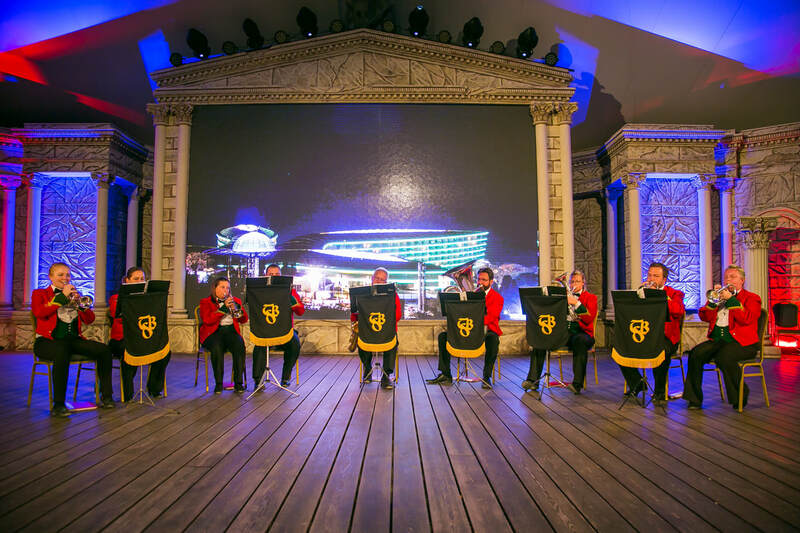 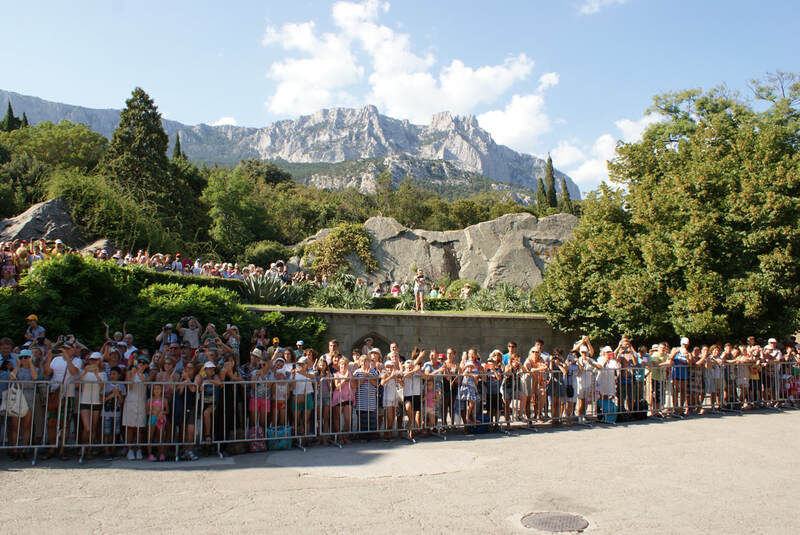 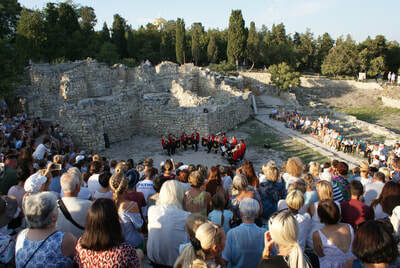 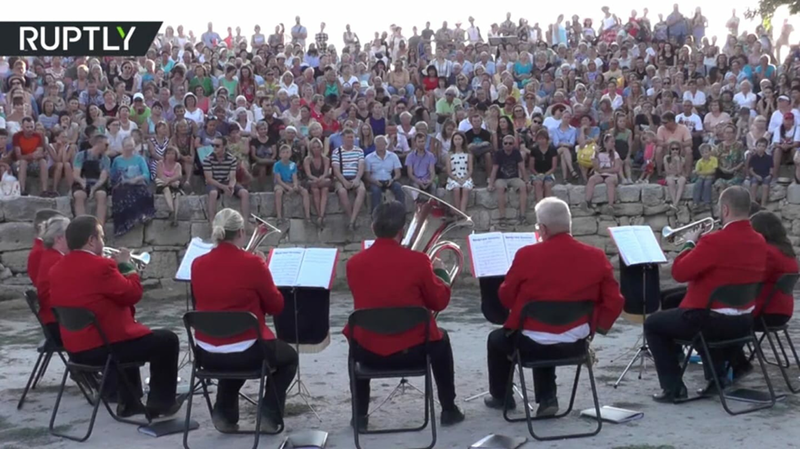 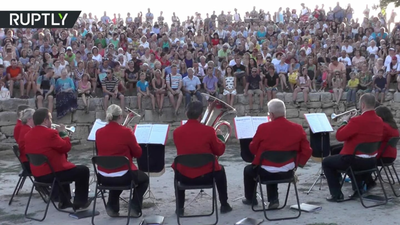 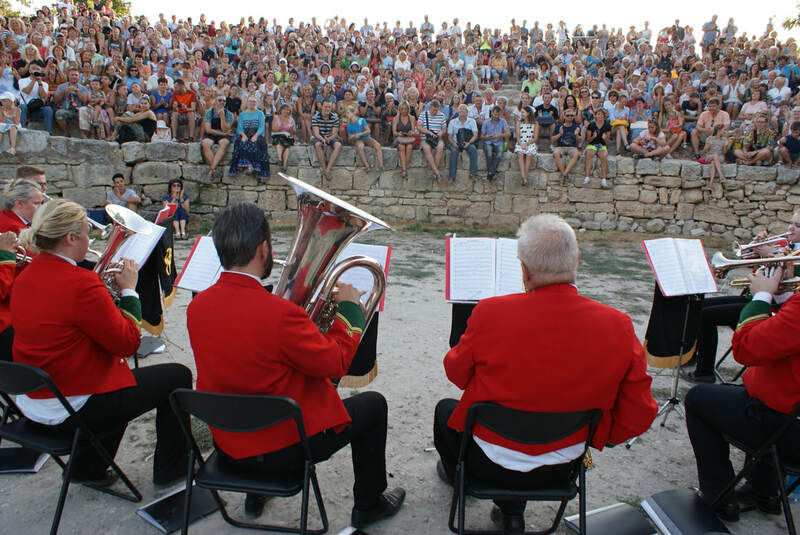 Following a tour of the museum and archaeological site, our ensemble performed for a large crowd of 600 people in the ancient amphitheatre, and were also afforded the opportunity to mix with the very appreciative audience members afterwards. 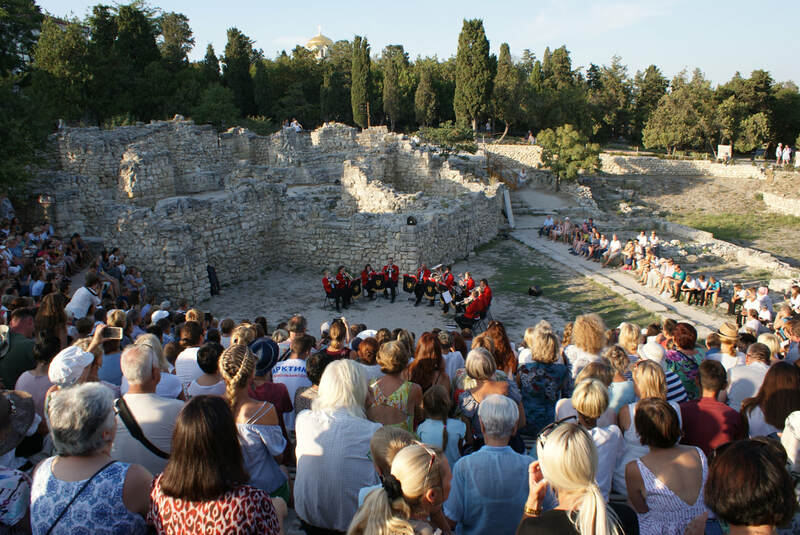 We then undertook an impromptu performance together with a visiting youth orchestra in the Byzantine court of the archaeological museum afterwards, much to the delight of the young musicians, audience - and us! 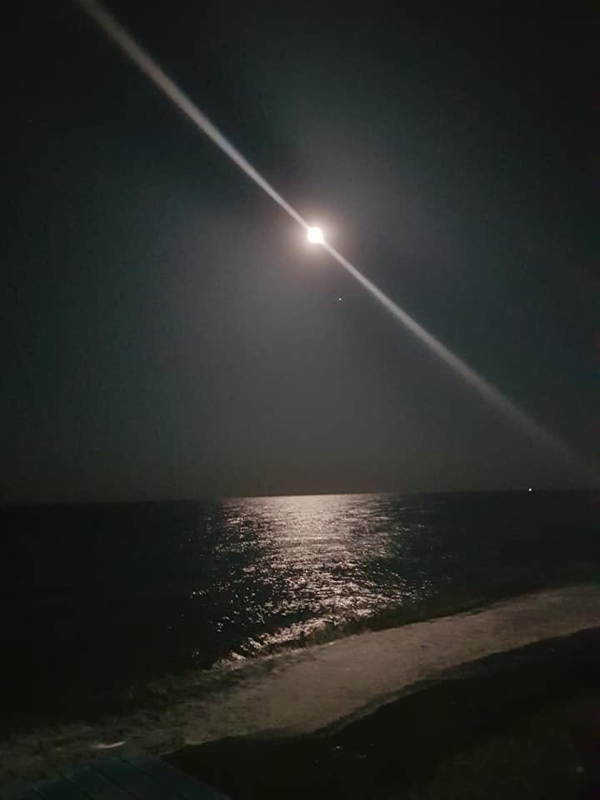 We closed the day with an open air meal in the museum grounds, overlooking the ocean and the heritage site, the very image of which is now featured on the new 200 rouble banknote. 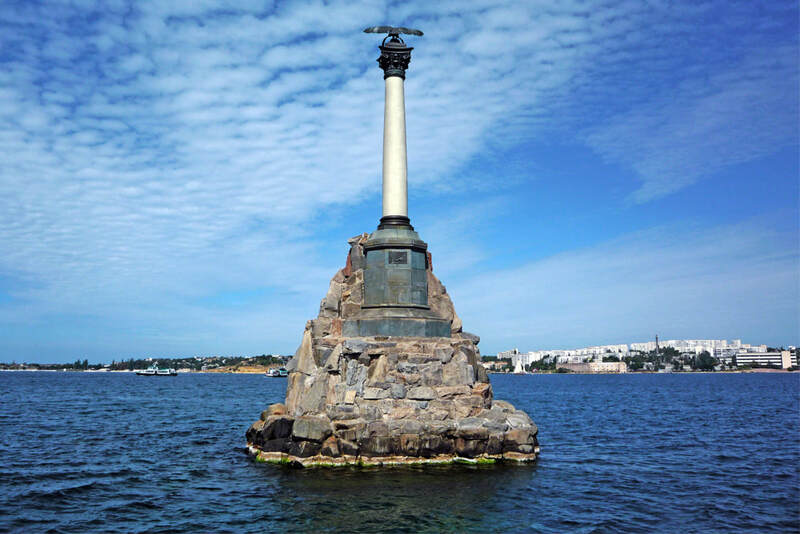 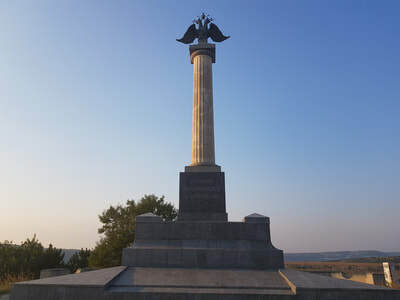 Sevastopol is the largest city on the Crimean Peninsula, a major port on the Black Sea and also the base of the Black Sea Fleet. 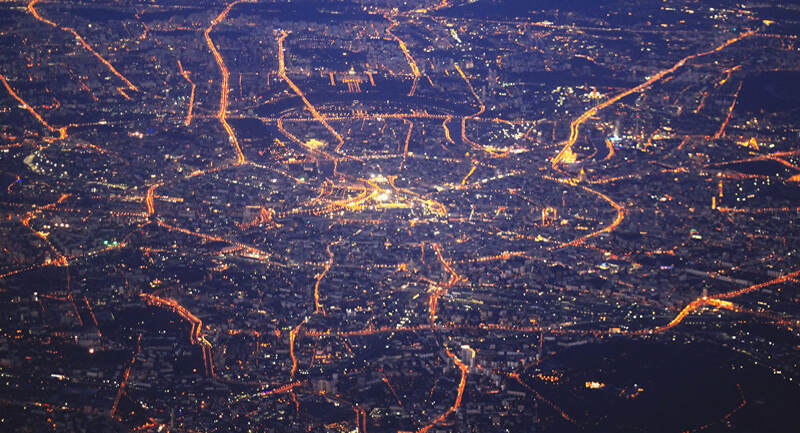 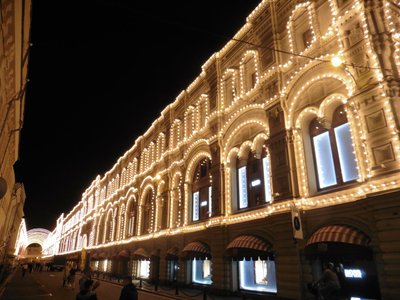 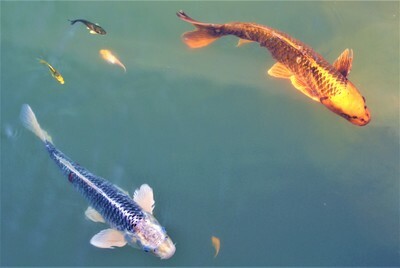 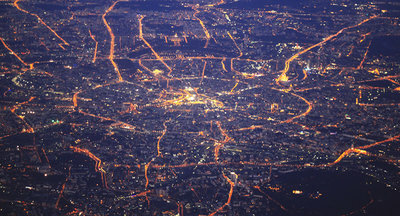 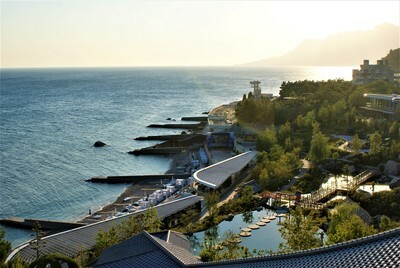 The city is a popular seaside resort and tourist destination, and boasts a rich history. 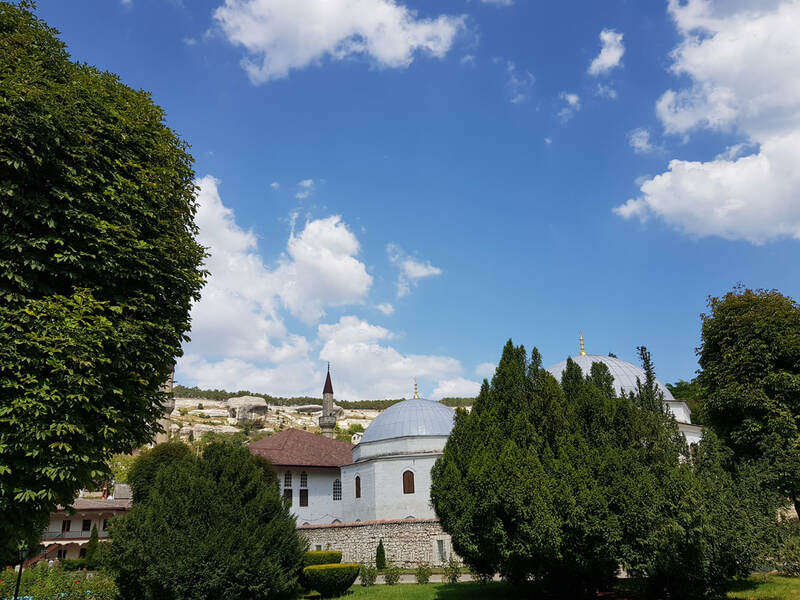 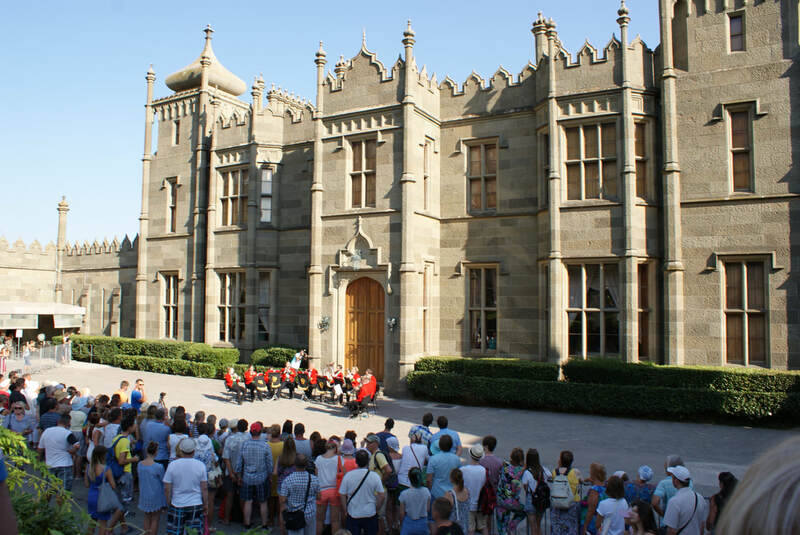 The Vorontsov Palace is an historic palace situated at the foot of the Crimean Mountains, and specifically Mount Ai-Petri, near the town of Alupka. 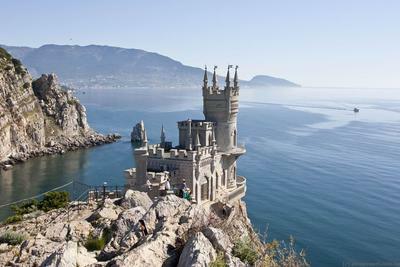 The palace is one of the oldest and largest palaces in Crimea, and one of the most popular tourist attractions on the southern coast. 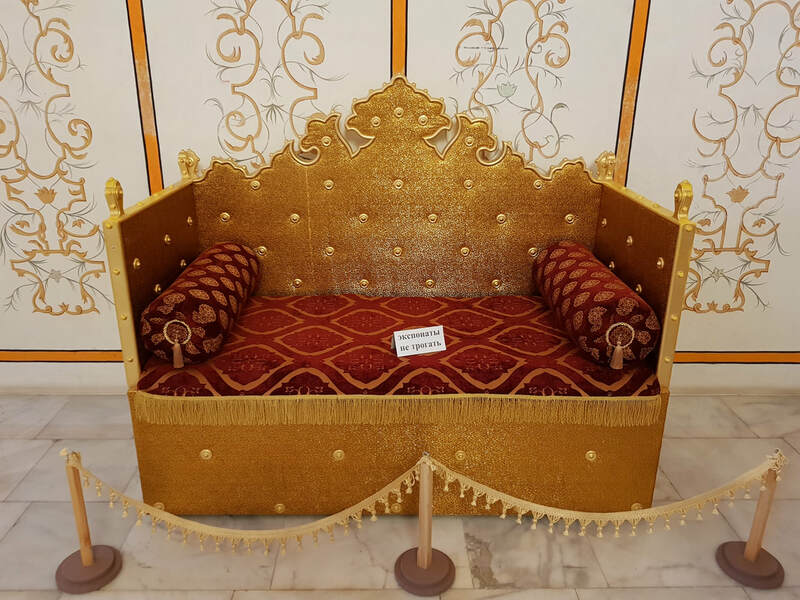 Built in the English Renaissance revival style by British architect Edward Blore and his assistant William Hunt, the palace is a hybrid of several architectural styles, including elements of Scottish Baronial, Mughal and Gothic Revival architecture. Blore himself had designed many buildings in the United Kingdom, and is particularly well known for completing the design of Buckingham Palace. 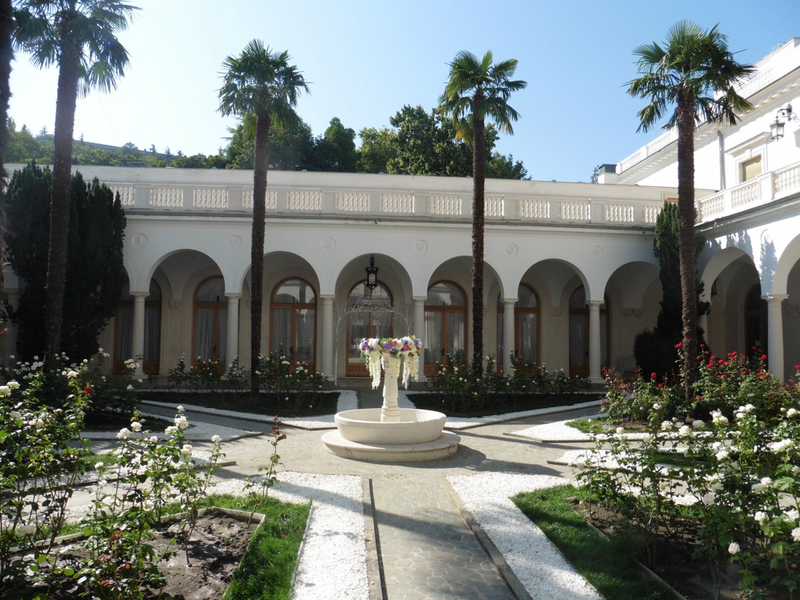 From 11 to 14 February 1945, when the Yalta Conference took place in the neighbouring Livadia Palace, Sir Winston Churchill and the British delegation were given residence within the Vorontsov Palace. The palace's English-inspired architectural style gained praise from Churchill and he was so taken by the garden's Medici lions that he later asked Joseph Stalin if he could take one of them home. 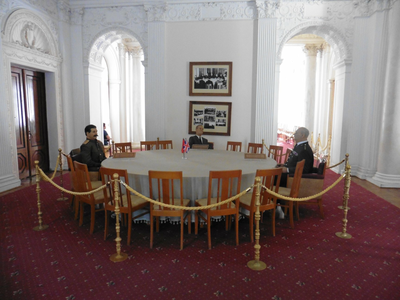 Stalin declined the request, but asked why. Sir Winston stated the sleeping lion looked like a portrait of himself, just without his beloved cigar. 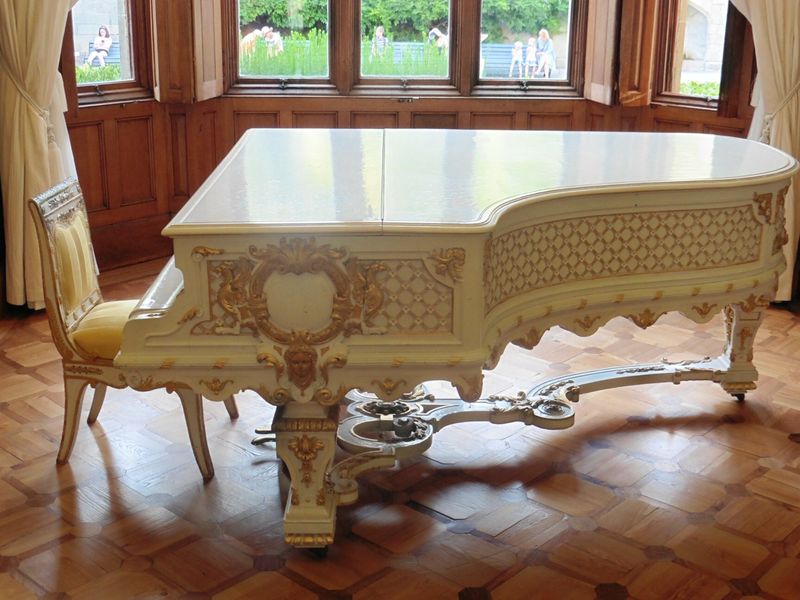 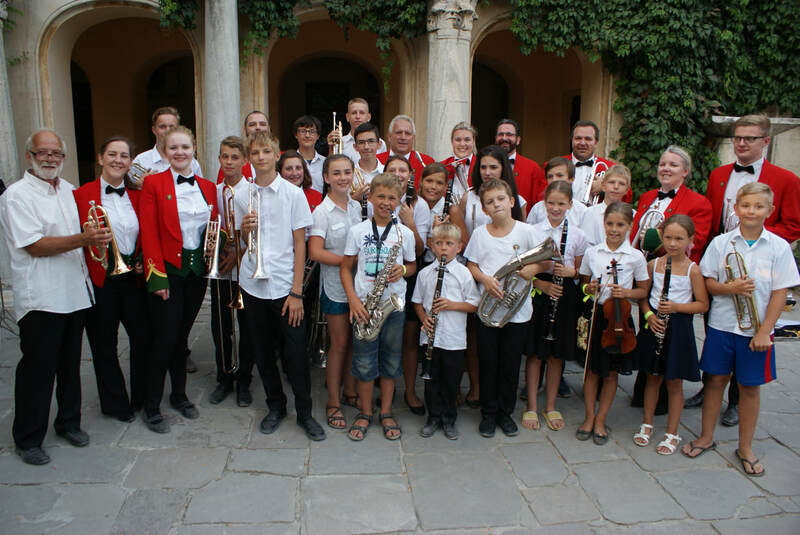 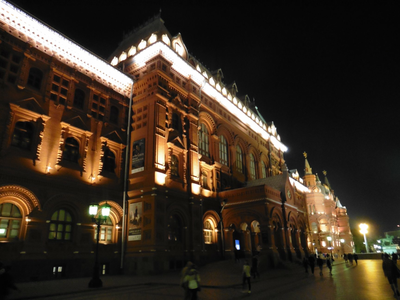 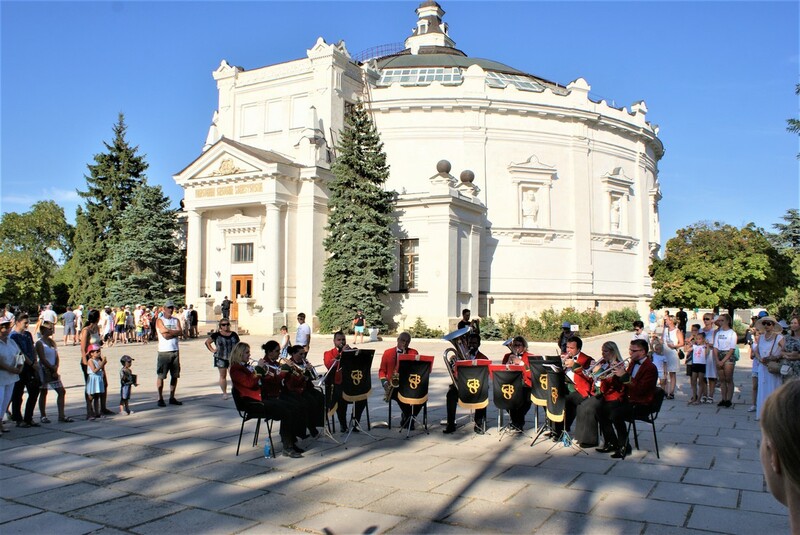 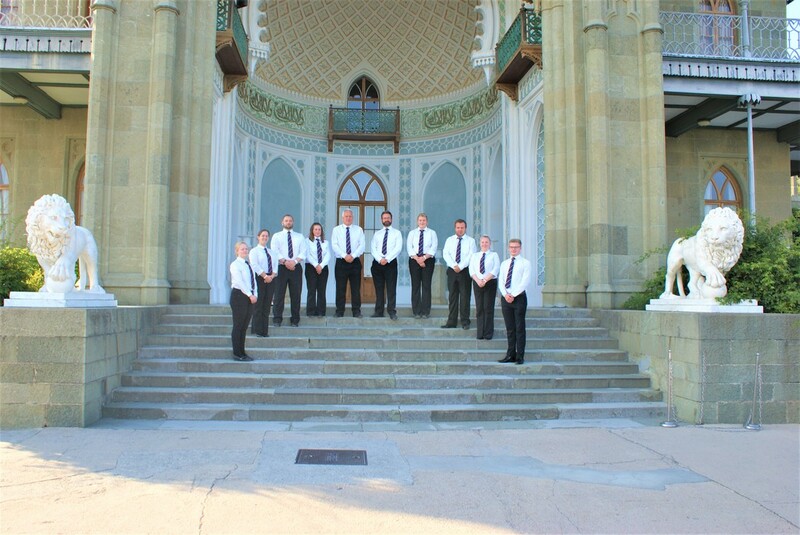 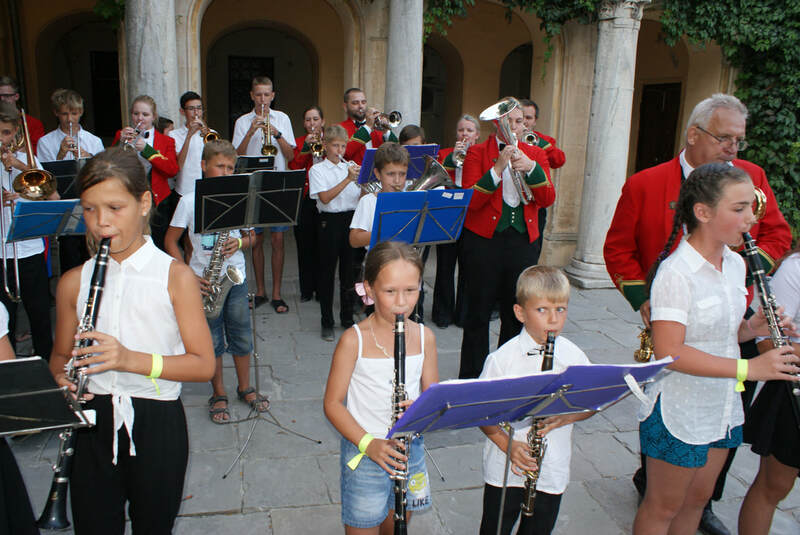 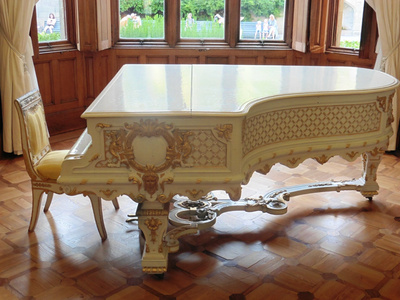 Our ensemble performed twice at the Vorontsov Palace. 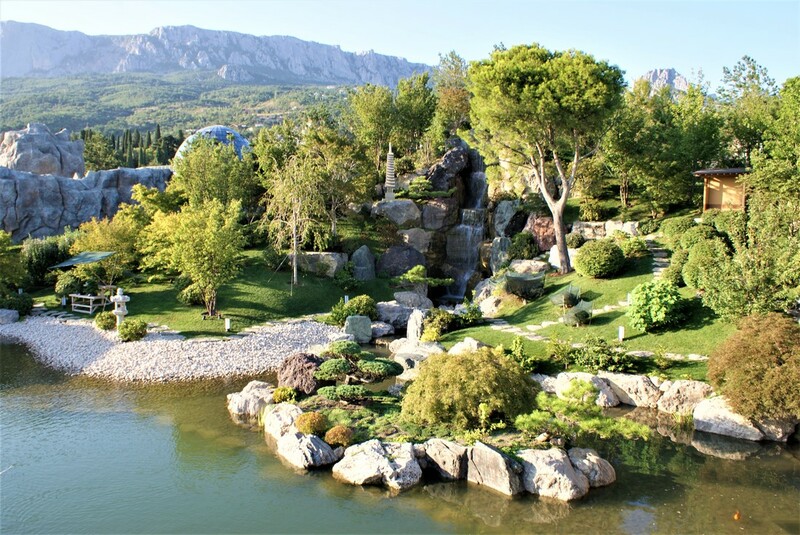 On the first visit we were treated to a guided tour, with translation, of the 40 hectares (99 acres) of gardens, which were arranged by the famed German landscape gardener Carolus Keebach. The ensemble then paraded & performed in front of the Palace itself, with Mount Al-Petri in the background. We again mixed with the assembled crowds for photographs and to speak with audience members. On our second visit, we received a guided tour of the Palace itself and then undertook a formal evening performance in the Palace Courtyard. At the performance, SBW MD Craig Roberts was awarded the Talent & Vocation Medal as a Worldwide Charitable Alliance Peacemaker by the International Coordination Council for the Development and Promotion of the Ideas of Peace. ​Following the performance and presentation we enjoyed a delightful meal at the superb Doctor Whisky restaurant in Yalta, which we're pleased to confirm stocks four varieties of the Welsh whisky "Penderyn". The renowned Massandra Winery was founded by Knyaz Lev Golitsyn in 1894 under the aegis of Tsar Nicholas II. 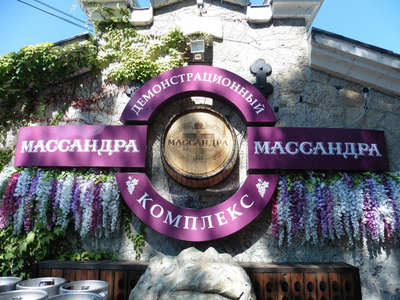 The enoteca of the winery contains about one million bottles! 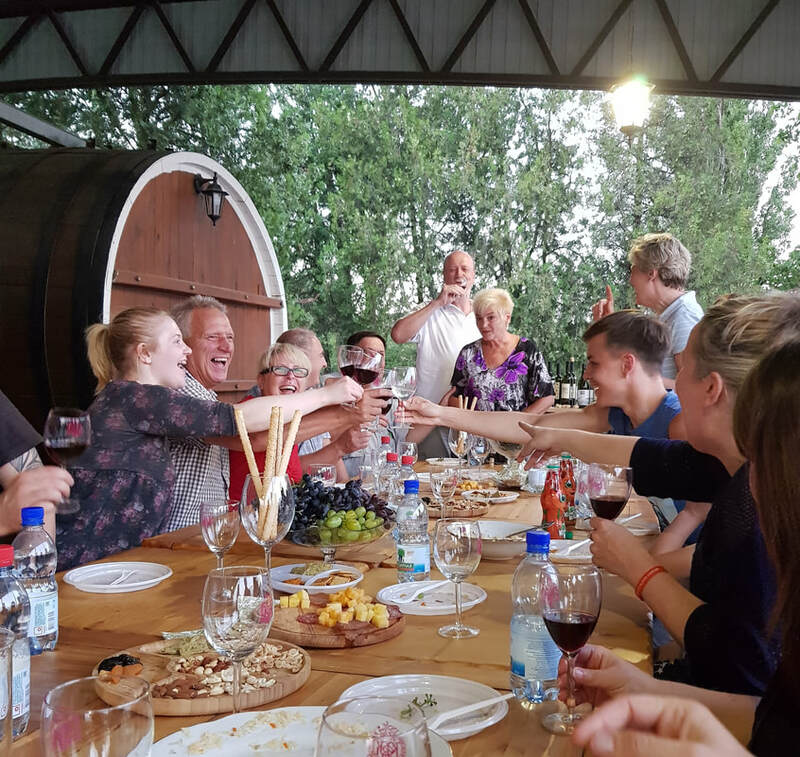 SBW were delighted to visit the famous winery & region, and to sample their incredible produce. 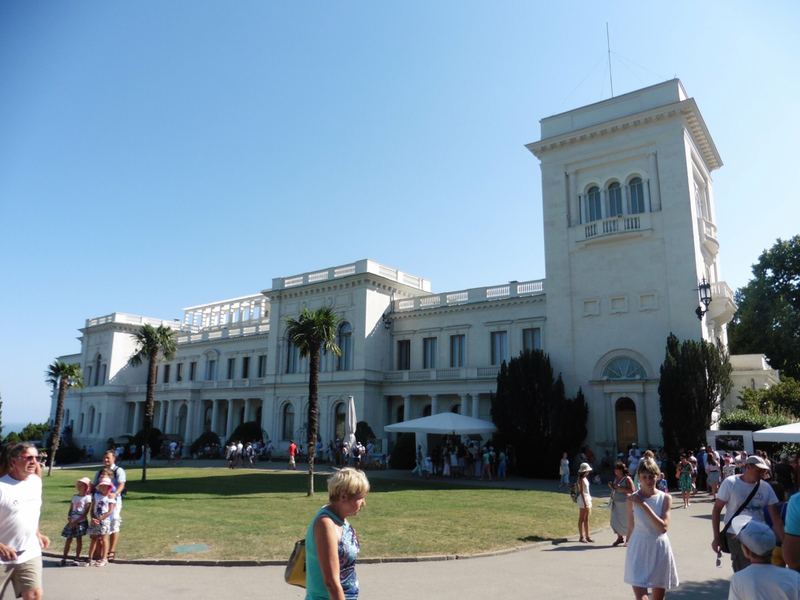 The Livadia Palace was a summer retreat of the Russian Tsar and his family. 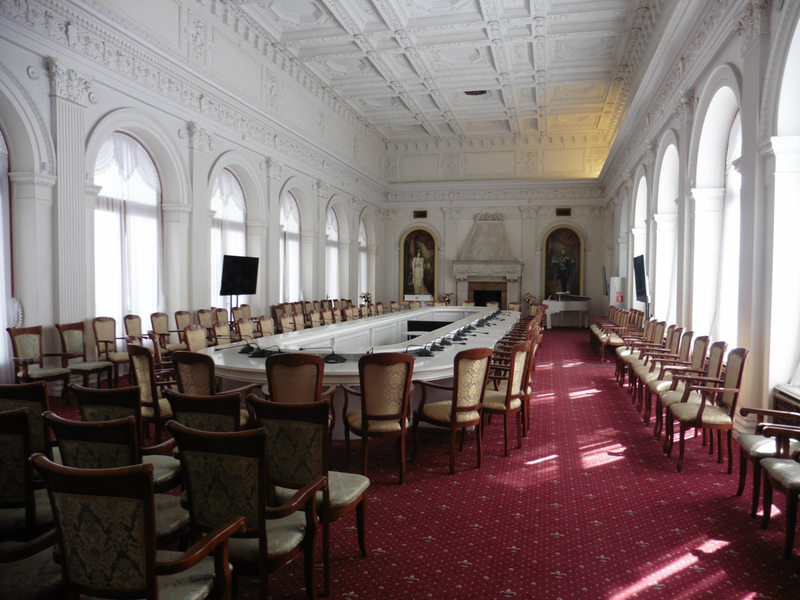 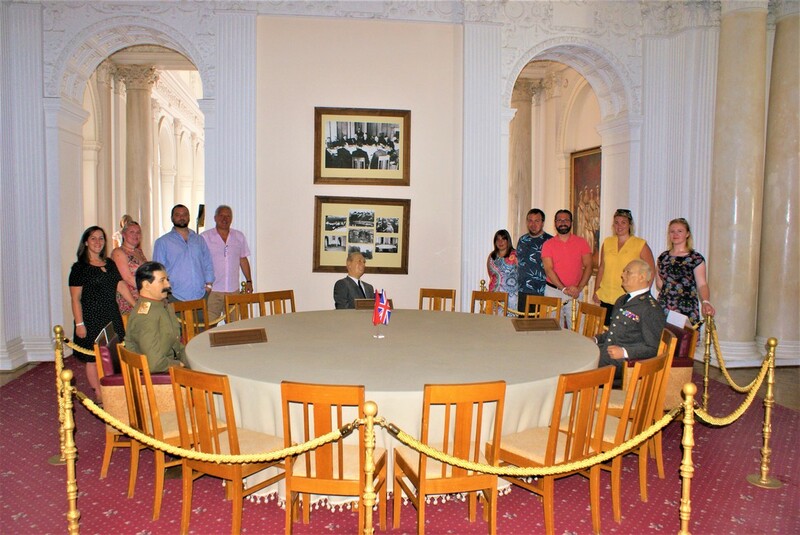 The Palace is famed in recent years as the venue for the Yalta Conference which was held there in 1945. 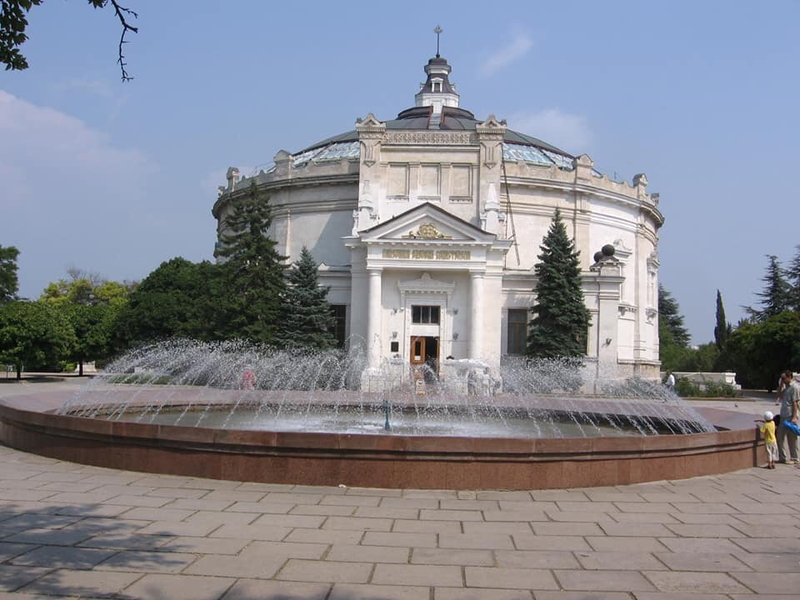 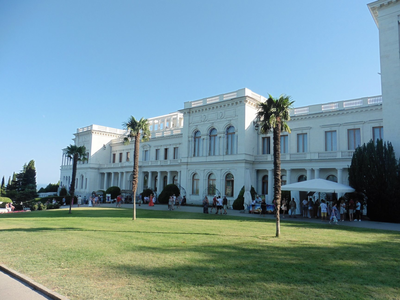 The palace was the base of the U.S. President Franklin D. Roosevelt and the American delegation, while the Russian delegation was housed in the nearby Yusupov Palace, and the British delegation at the Vorontsov Palace. 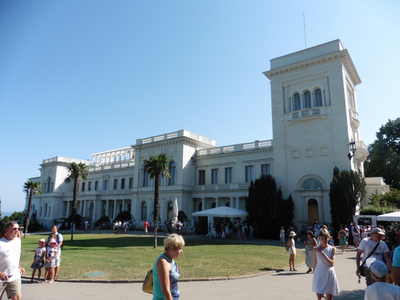 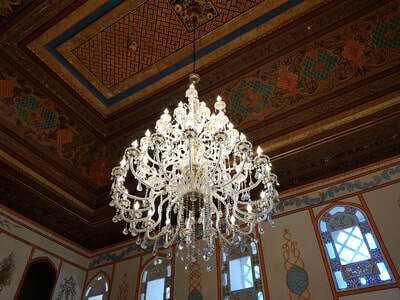 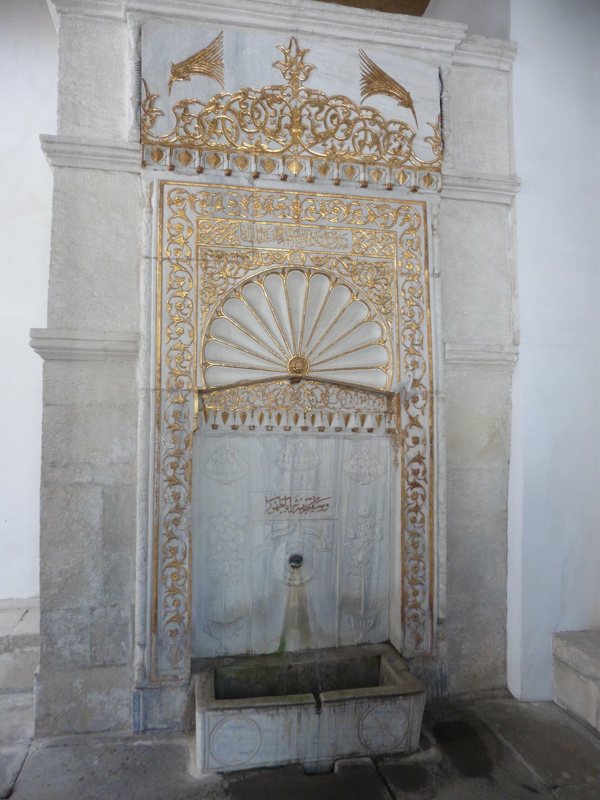 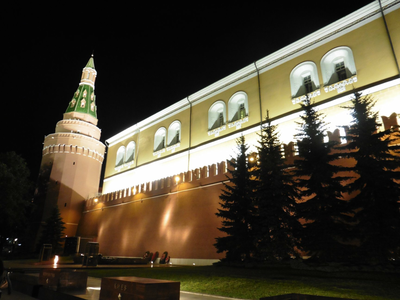 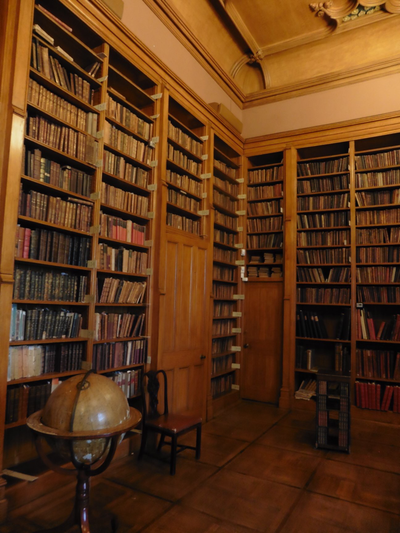 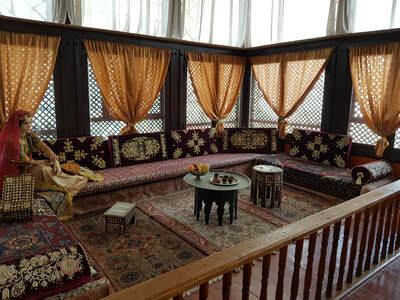 Today the palace houses a museum, and is also occasionally used for international summits. 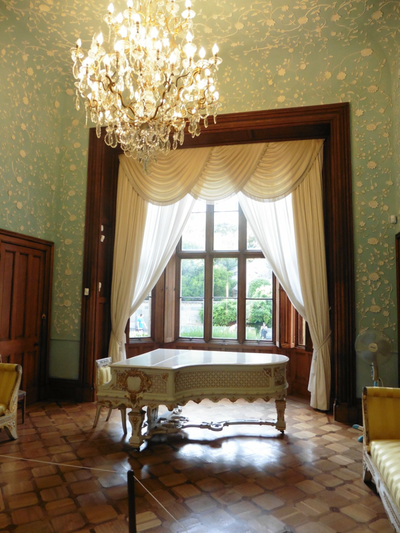 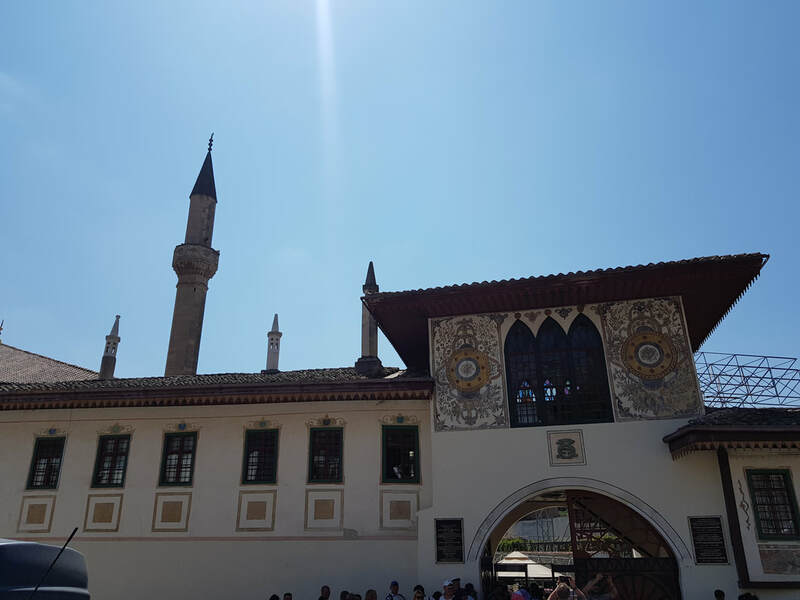 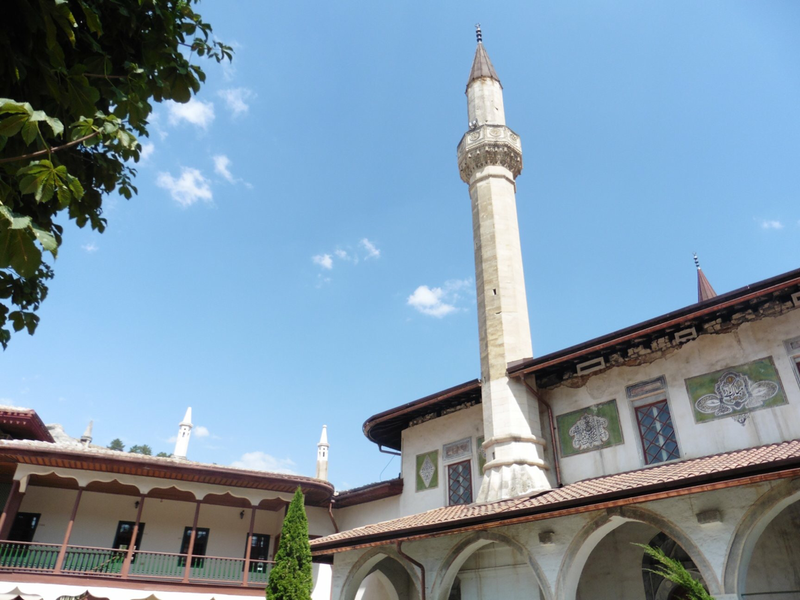 The Livadia Palace is built of white Crimean granite in a Neo-Renaissance style and contains 116 rooms, with interiors furnished in a wide variety of different styles. 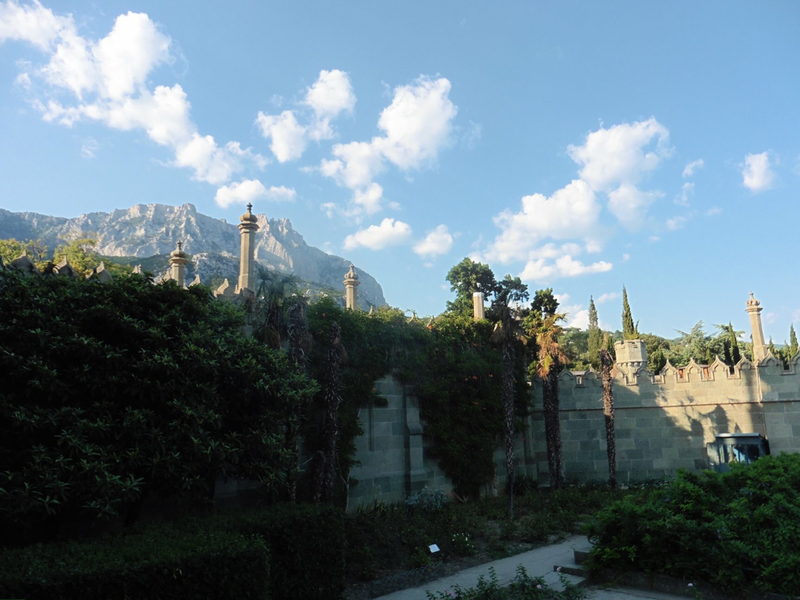 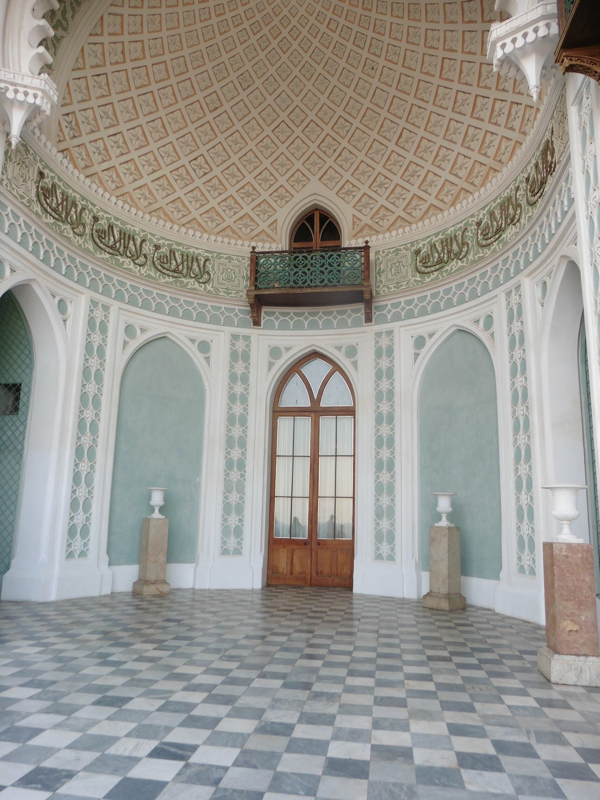 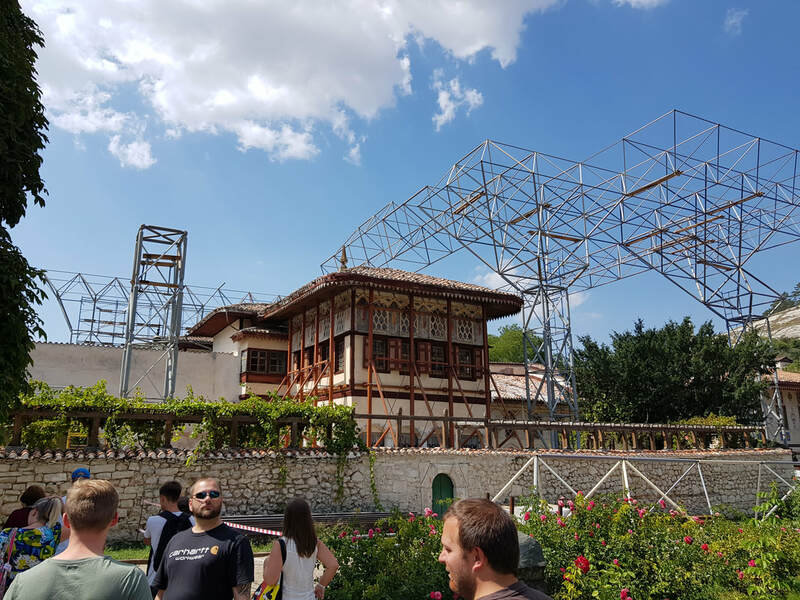 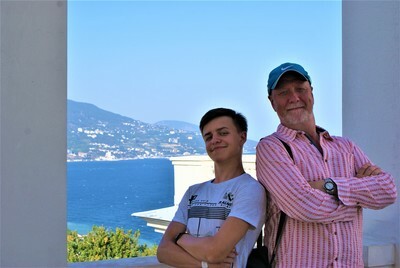 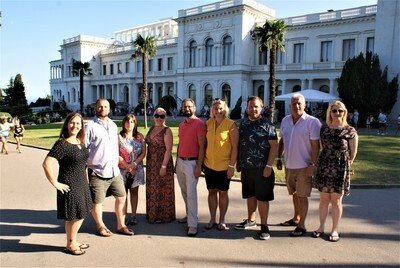 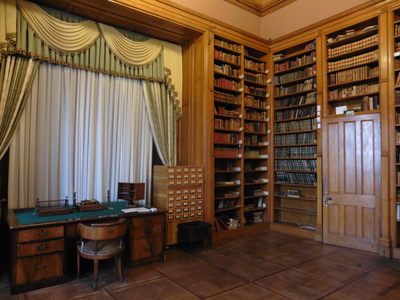 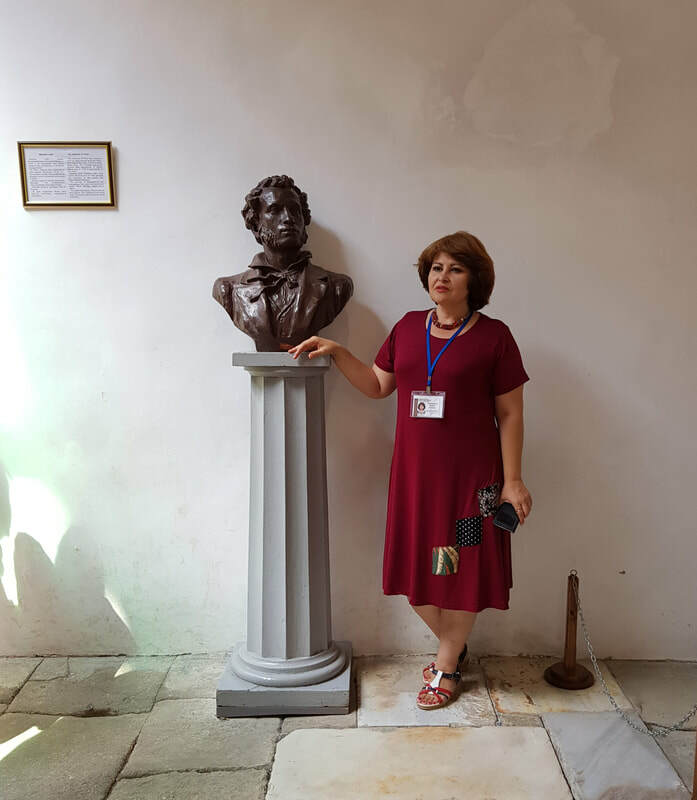 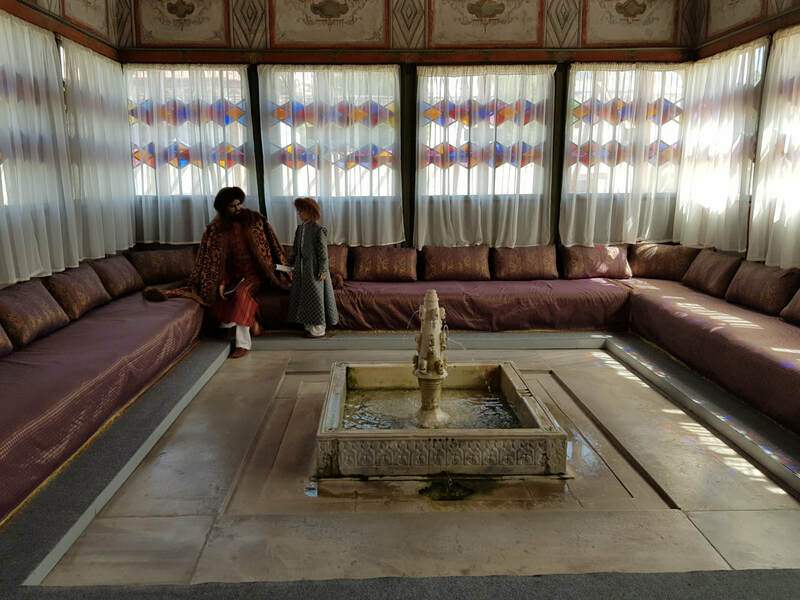 Our ensemble was treated to a guided tour of the Palace by the Curator, including the rooms used for the Yalta Conference, the Tsar's private rooms and study, plus a special visit to the rooftop balcony overlooking Yalta and the Black Sea coast. The Mriya Resort and Spa is an incredibly luxurious ocean view hotel, created with the mission of "the creation and development of new international standards for the hospitality industry in Russia". The concept and details of the project were developed by the famed British architect Sir Norman Foster, recipient of the Prince of Asturias Award, Pritzker Architecture Prize and architect of Wembley Stadium, the Millennium Bridge, City Hall and St Mary Axe in London, the Hearst Tower in New York City and Hong Kong airport. 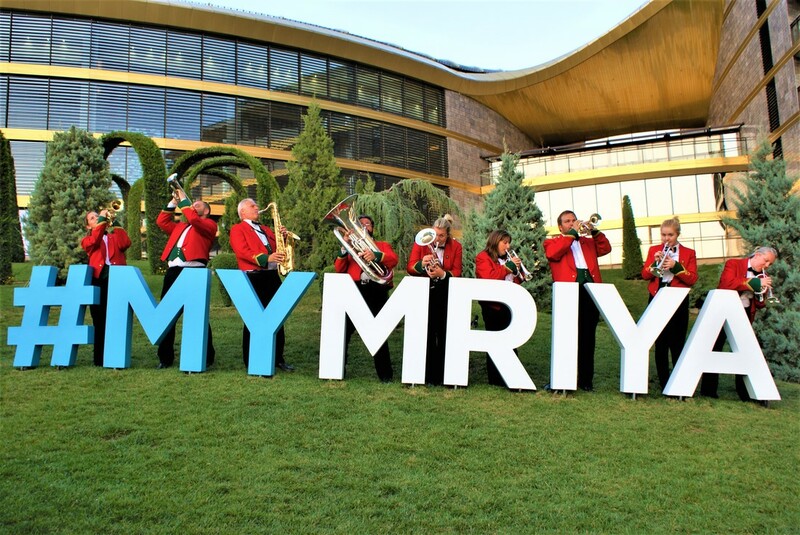 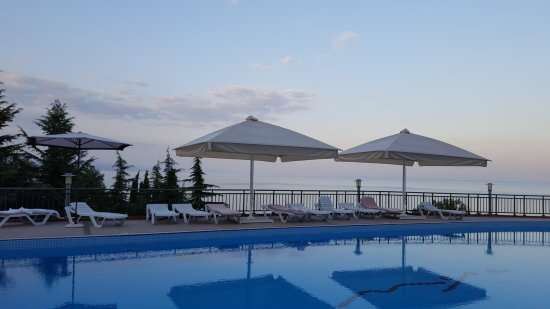 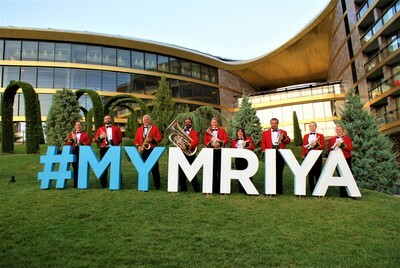 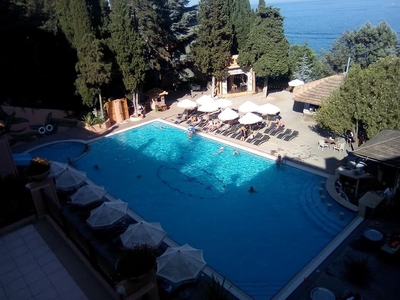 The Mriya Resort opened its doors on August 14, 2014, and offers its guests 408 premium-class rooms, consisting of 360 DeLuxe rooms (38 m2), 36 Family Suites (78 m2) and 12 Royal suites (192 m2). 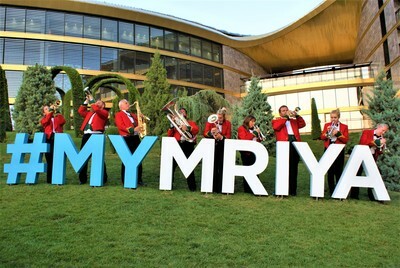 The Mriya also offers guests 14 villas on a separate territory: 2 presidential villas (618 m2), 12 family villas (196 m2) and 3 premium villas (600 m2). 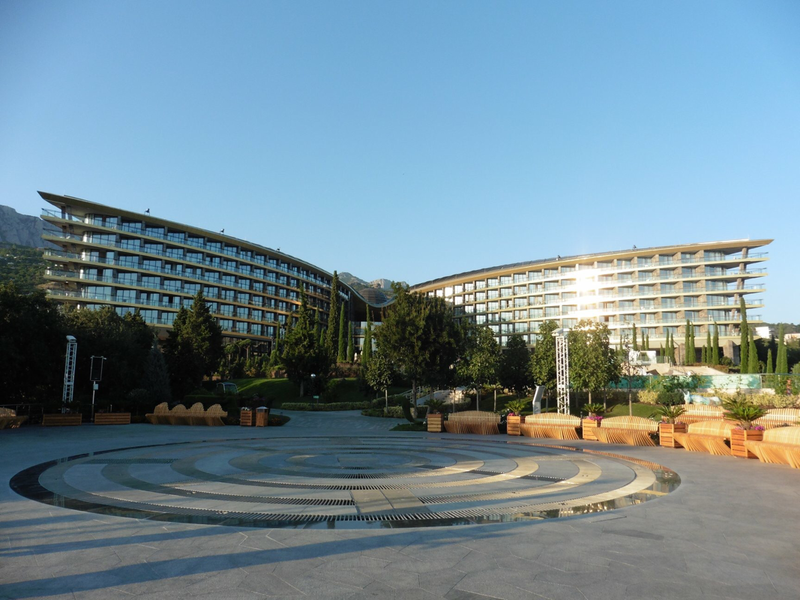 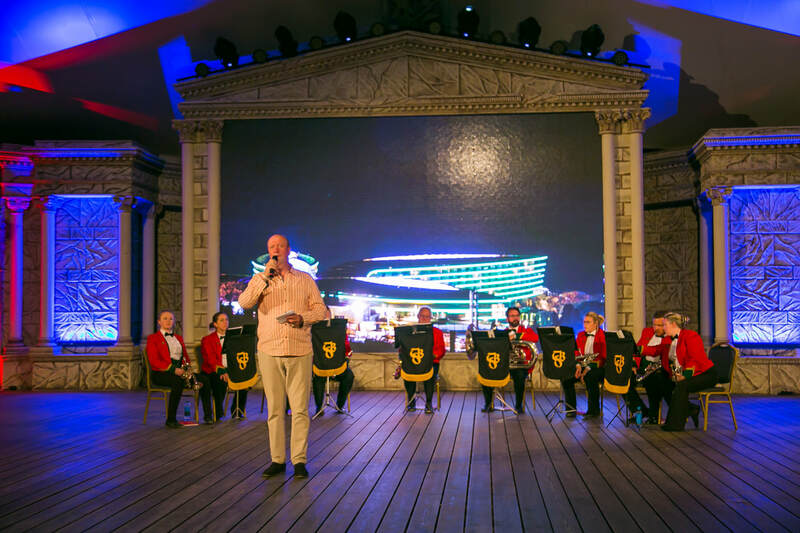 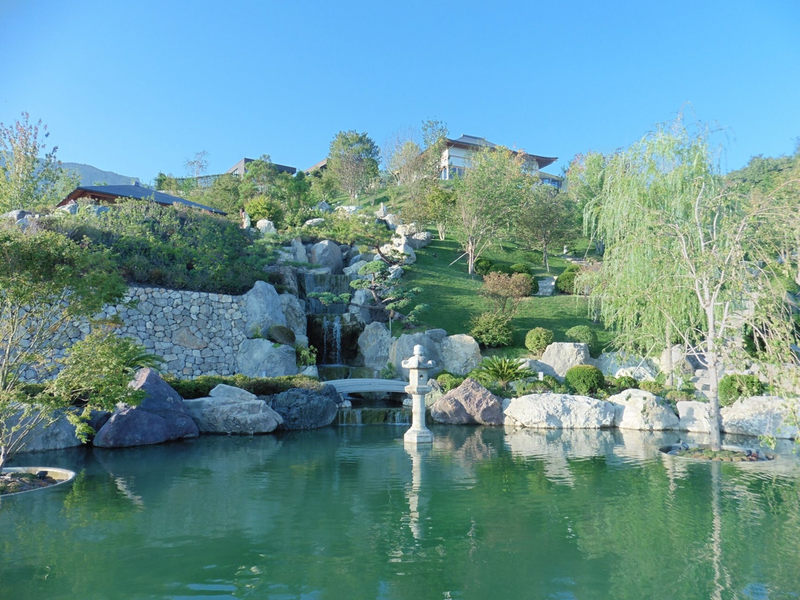 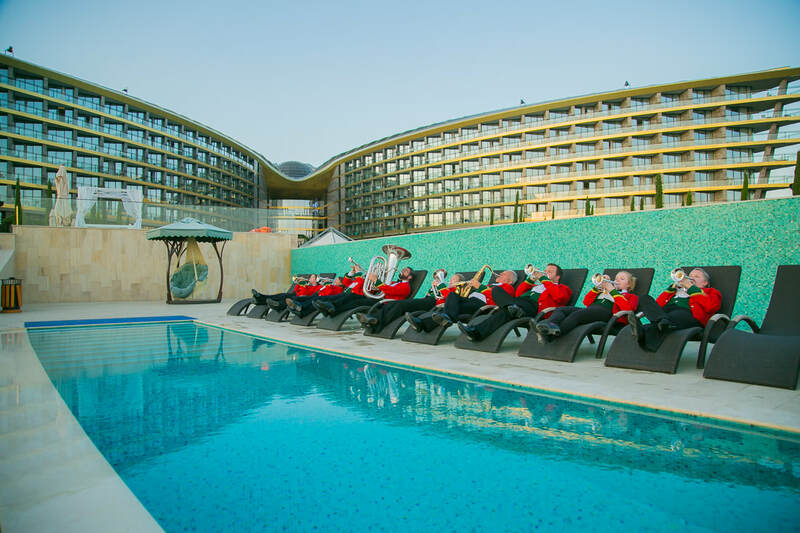 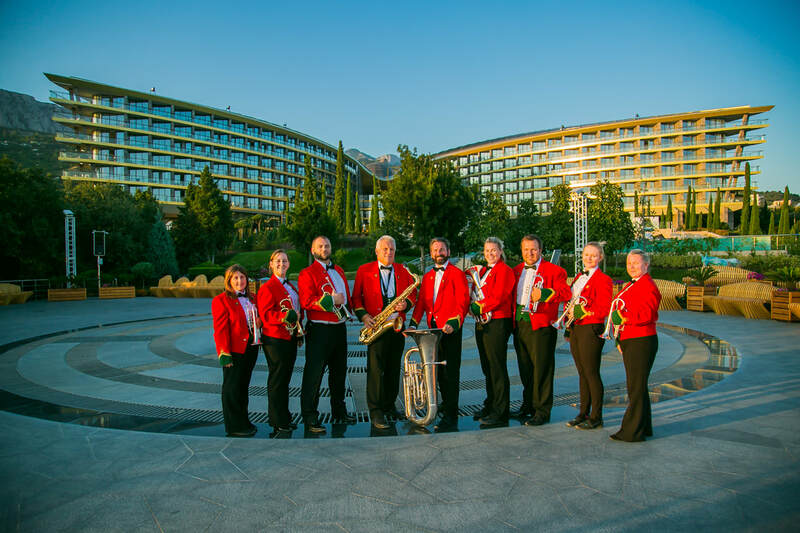 During our visit, SBW were treated to a tour of the hotel and newly completed Japanese Gardens (opened August 2018) and an evening meal, before performing an evening concert for guests in the state of the art Mriya amphitheatre. 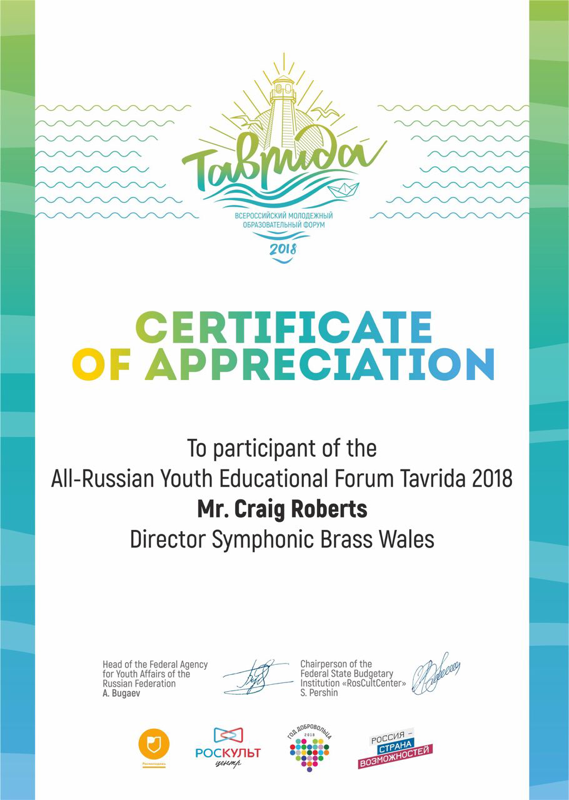 The Tavrida National Youth Educational Forum was taking placing for the third consecutive year during our visit. 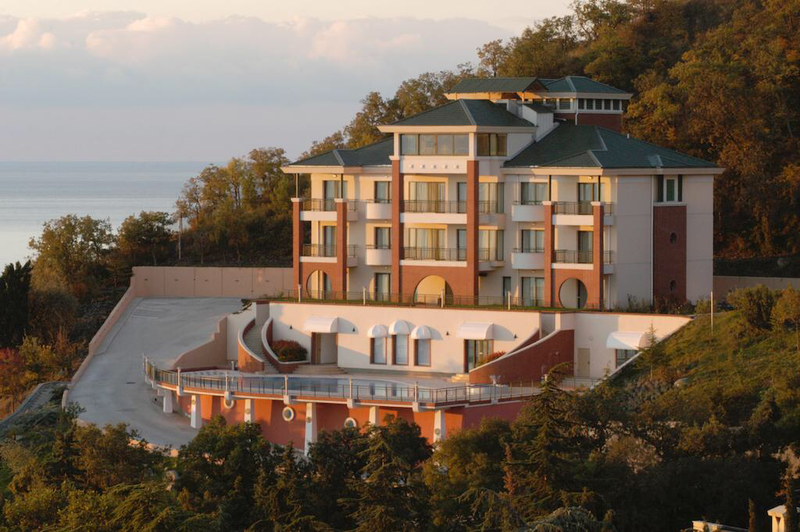 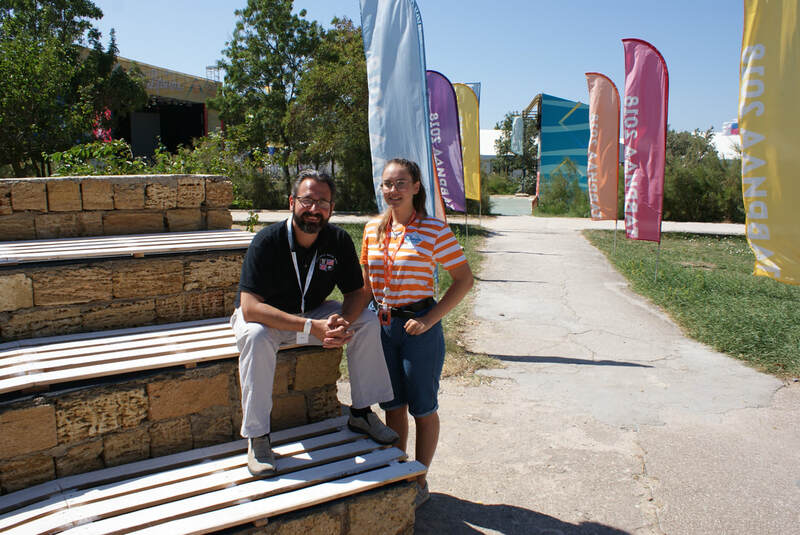 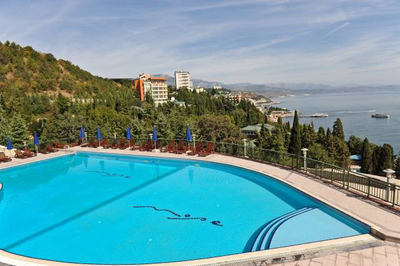 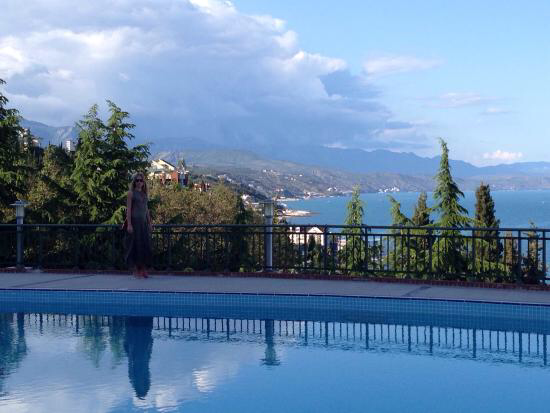 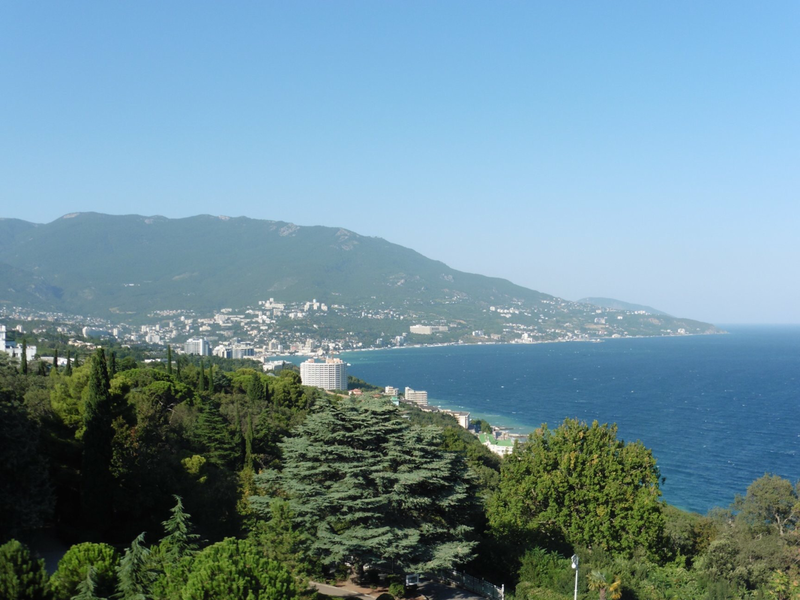 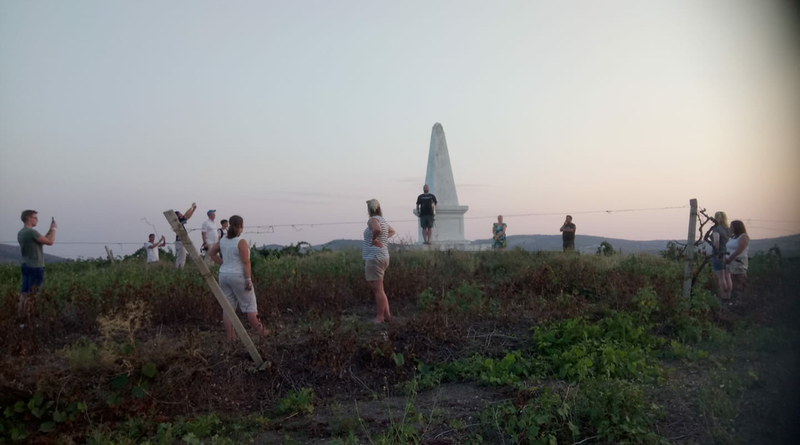 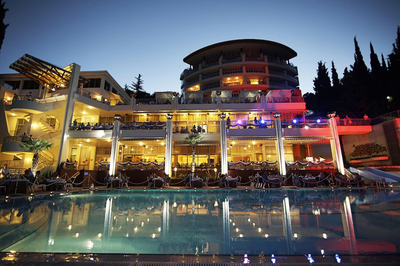 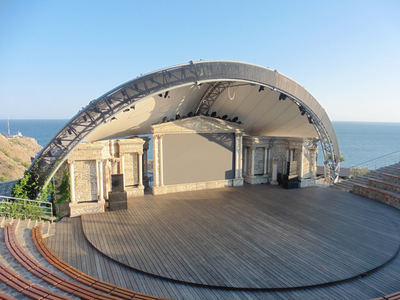 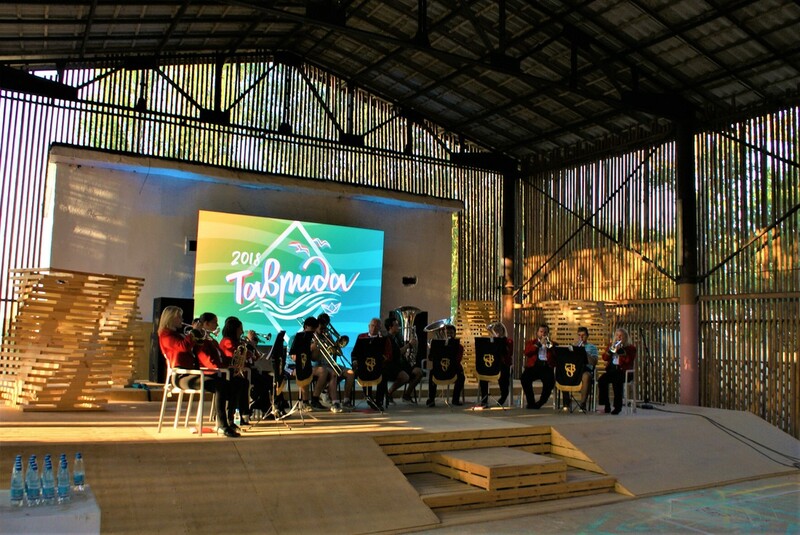 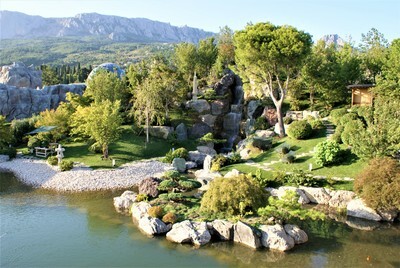 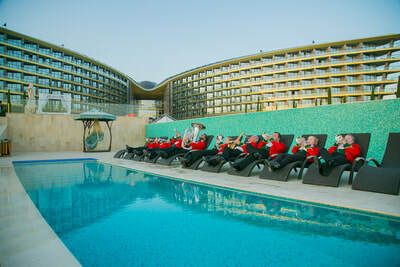 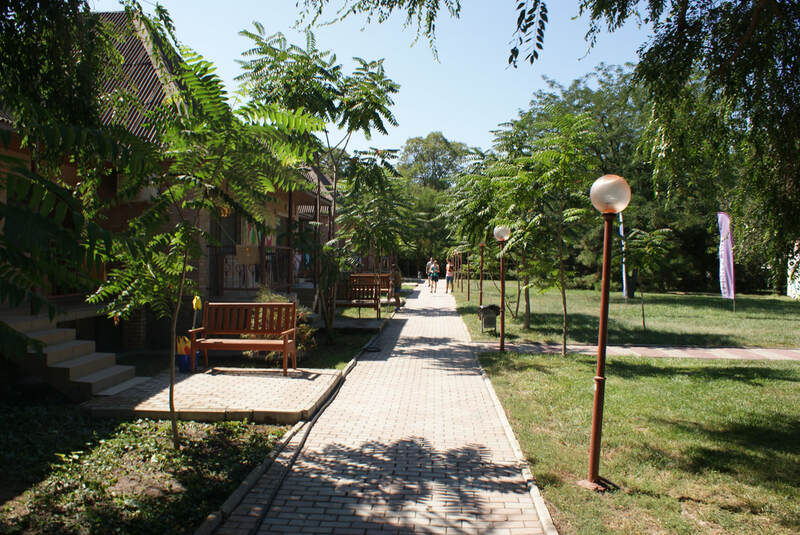 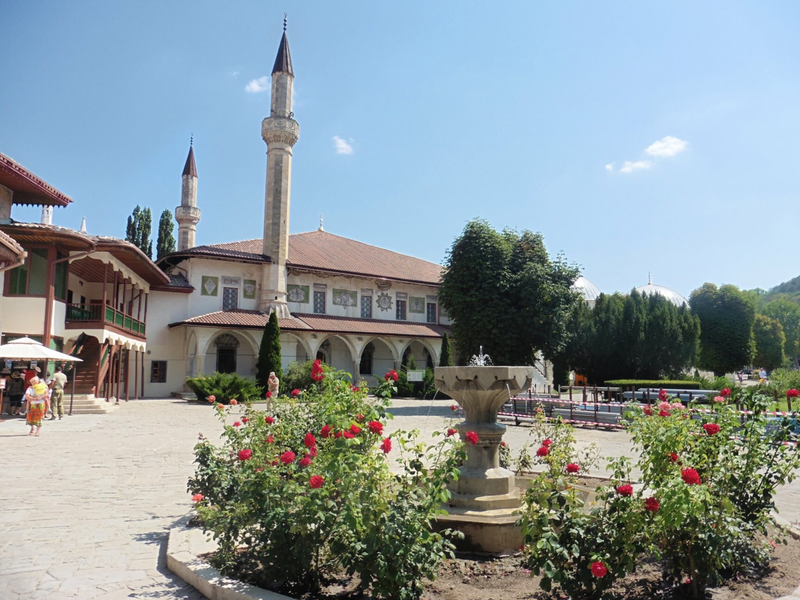 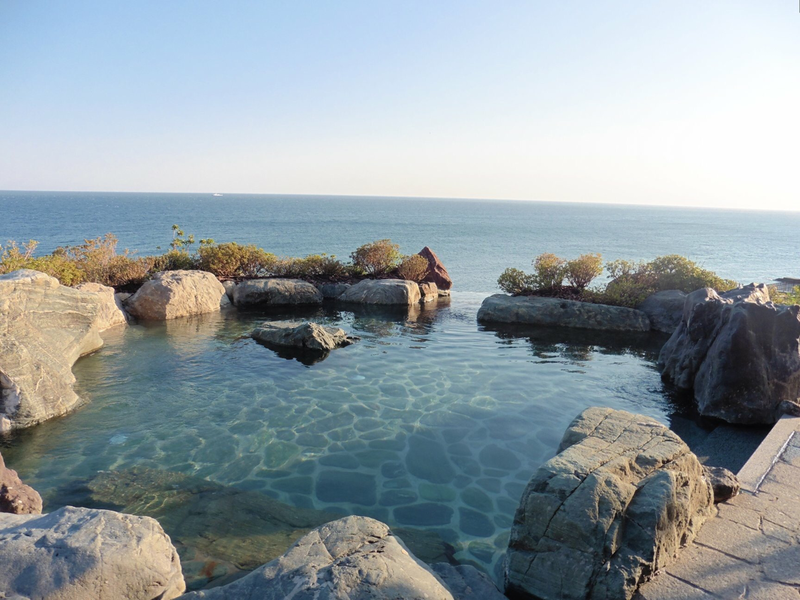 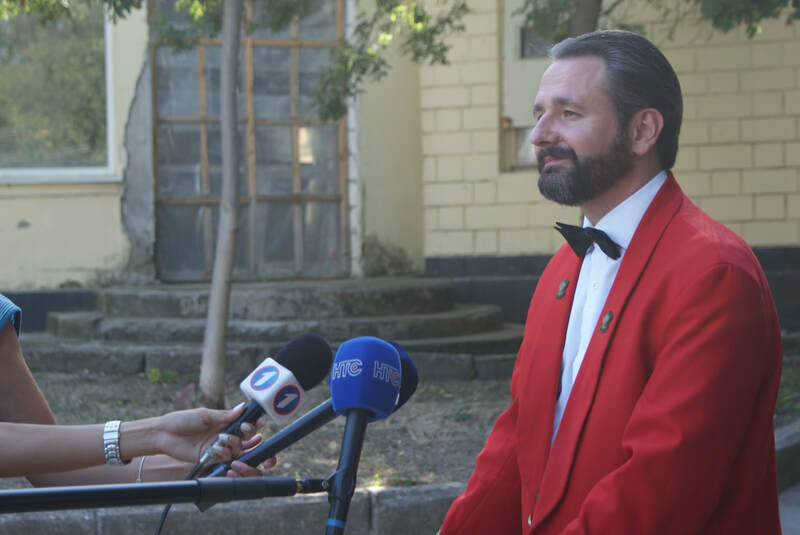 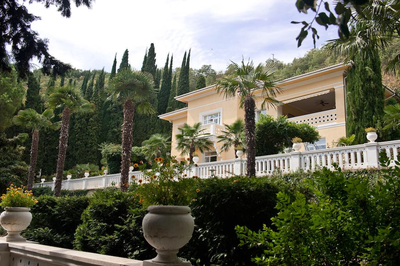 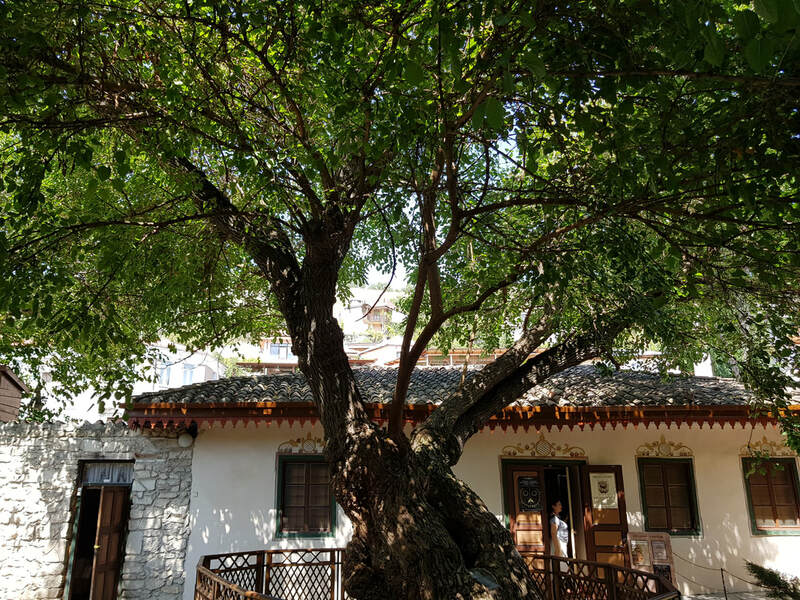 The Forum is held in Bakal's'ka Kosa in a dedicated former holiday resort, located in the North of Crimea. 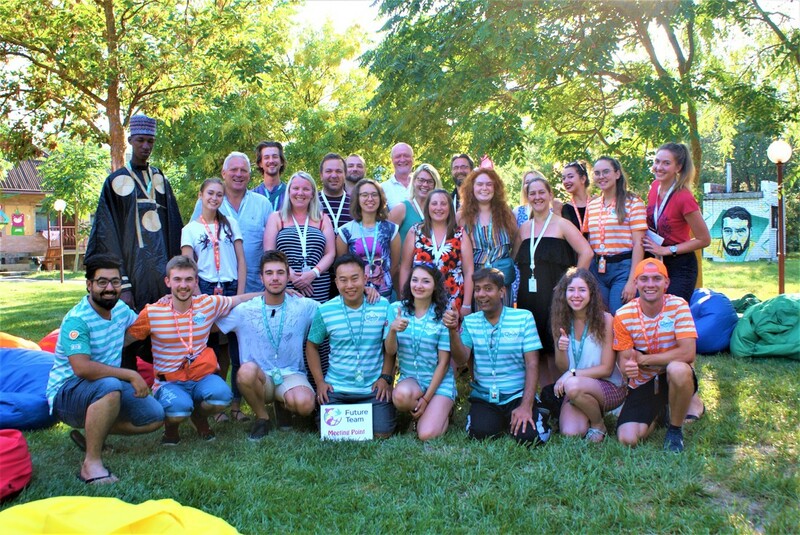 The camp brings together talented young people and experts from various fields – design, architecture, literature, history, fine arts, music, cinema, animation, journalism, museum studies and more. 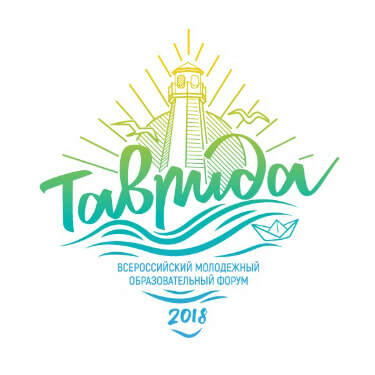 Delegates are drawn from all across Russia and beyond. During our visit we met young people from across the Russian Federation and also from Iraq, India, Serbia & Gambia. 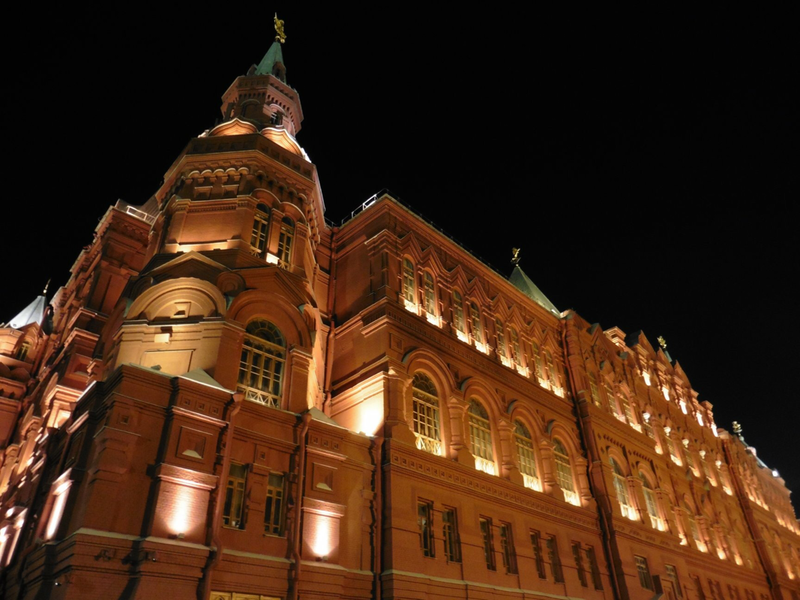 The state funded event aims to form professional communities comprised of creative young people and is organised by the Federal Agency for Youth Affairs, the Russian Centre for Civil and Patriotic Education of Children and Youth (Rospatriottsentr) and the Moscow State Institute of Culture. 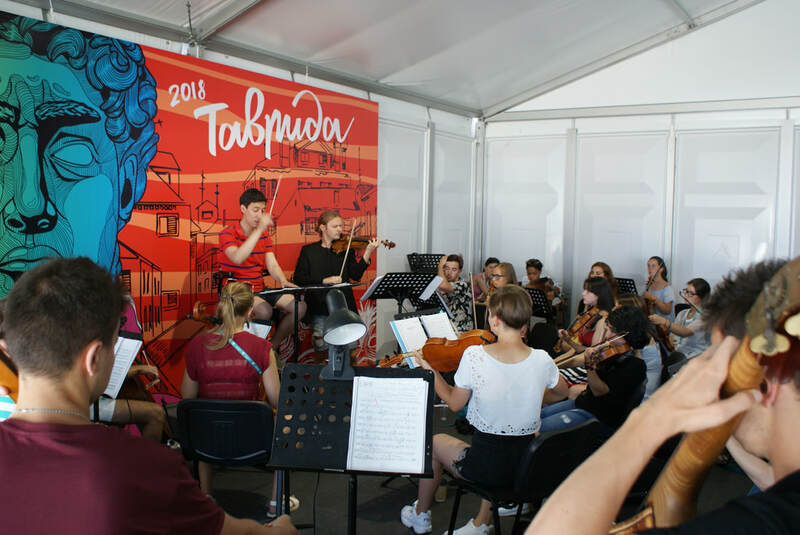 During our visit we were given a guided tour of the facility and observed an orchestral rehearsal of tremendous standard featuring both Gershwin: Fantasy on Porgy & Bess and Márquez: Danzón No. 2. We also participated in an open discussion forum with the delegates of Tavrida and performed a concert together with young brass musicians from the orchestra. During the Middle Ages, Balaklava was controlled by the Byzantine Empire and then by the Genoese who conquered it in 1365. 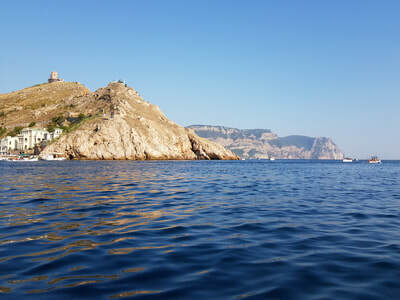 The ruins of a Genoese fortress positioned high on a clifftop above the entrance to the Balaklava Inlet are an iconic landmark and a popular tourist attraction. The Byzantines called the town Yamboli and the Genoese named it Cembalo. 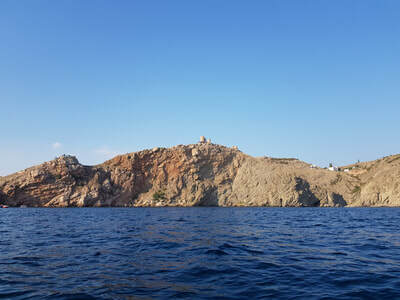 In 1475 however, Cembalo City was conquered by Turks and they renamed it Balyk-Yuva (Fish's Nest) which subsequently became "Balaklava" as its known today. 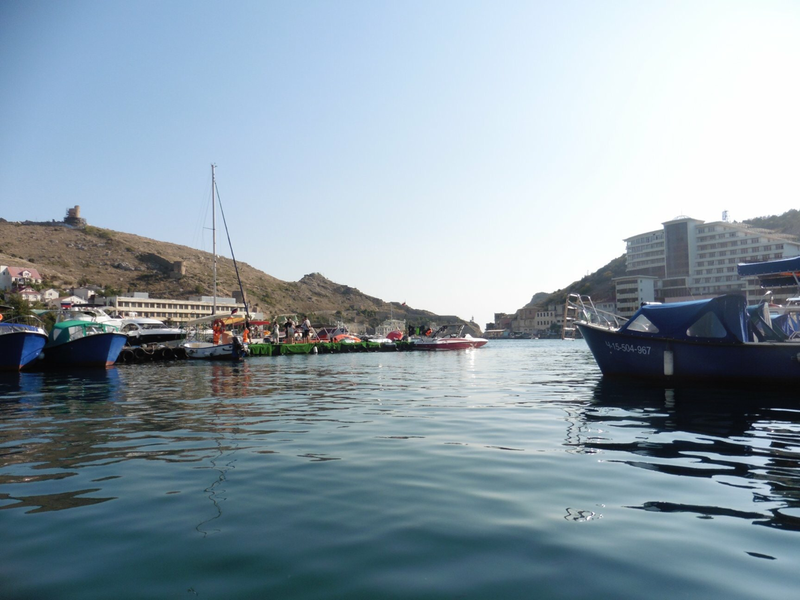 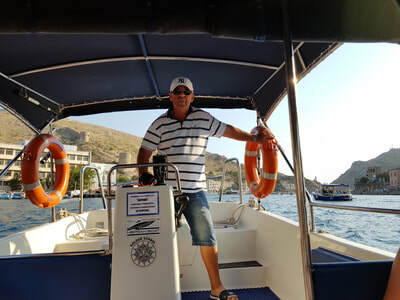 A feature of Balaklava is the bustling harbour where we decided to take a boat trip. Our pilot guides were incredibly knowledgeable and outlined the history of the harbour from its origins through the Genoan period and into modern day. 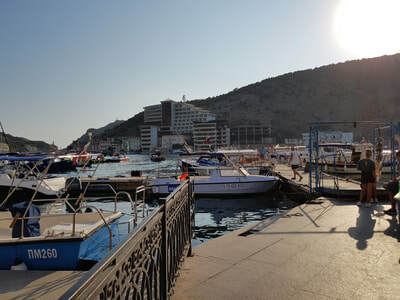 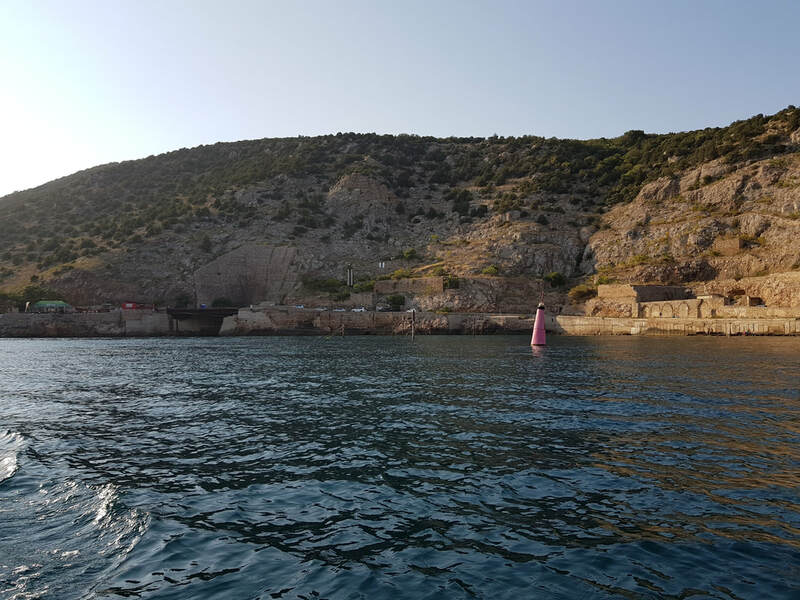 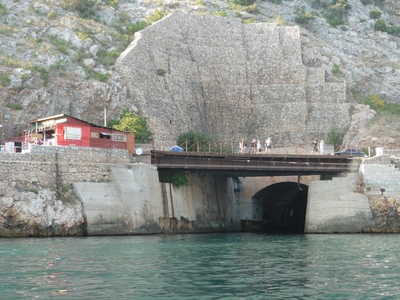 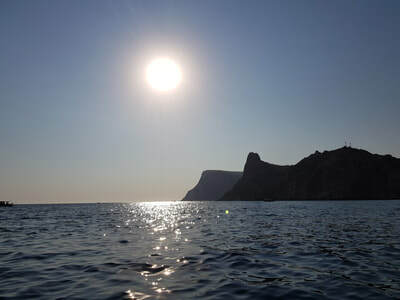 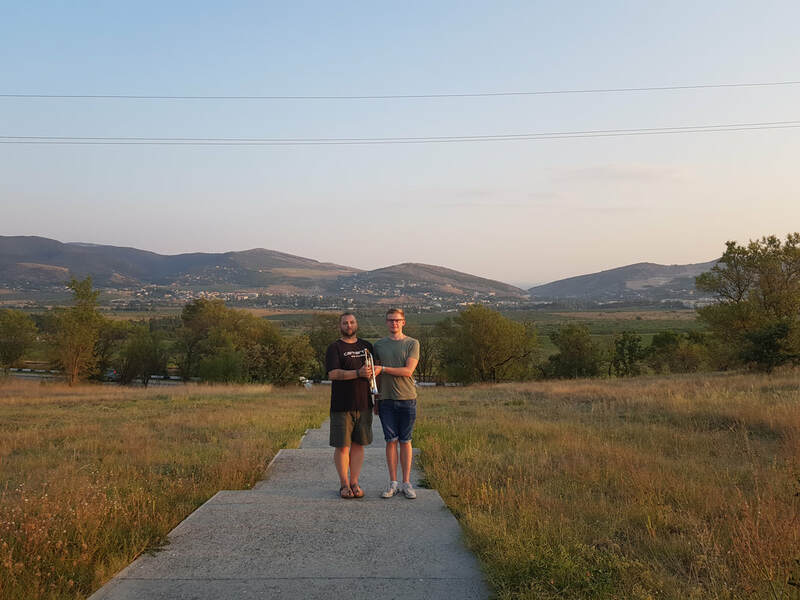 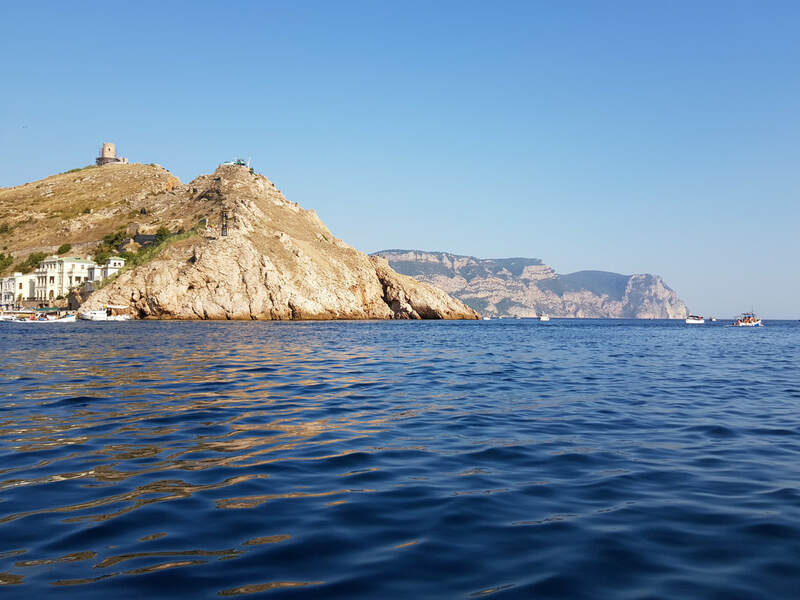 During the Second World War, Balaklava was the southernmost point in the Soviet-German lines​ and one of the functions of the harbour during this time was as an underground, formerly classified submarine base, which remained operational until 1993. The base is said to be virtually indestructible and is designed to survive a direct atomic impact. 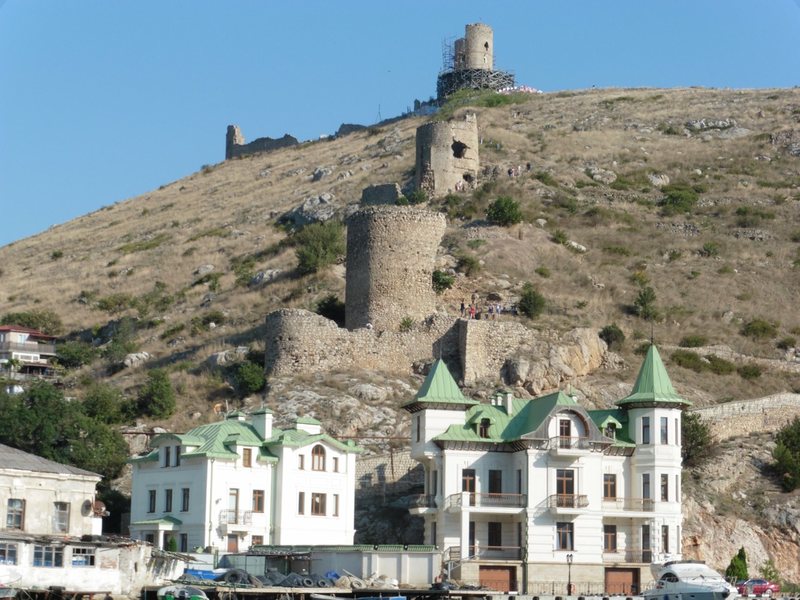 During this period, Balaklava was one of the most secret residential areas in the Soviet Union. 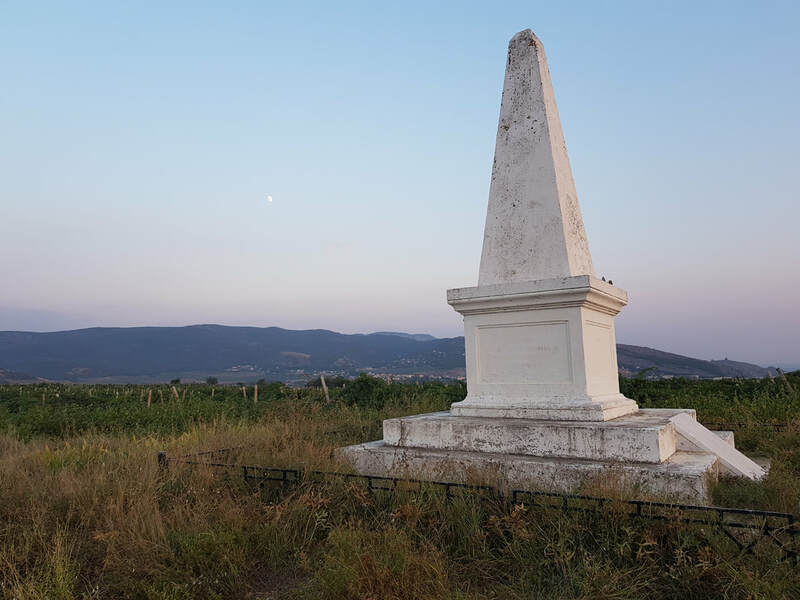 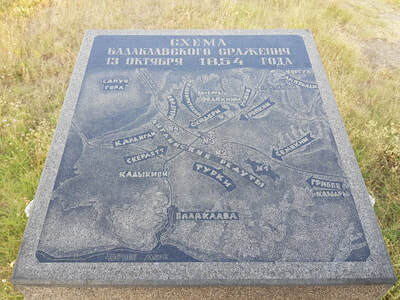 The region was not featured on any maps and, at one time, almost the entire population of Balaklava worked at the base - even family members could not visit the town without good reason and proper identification. 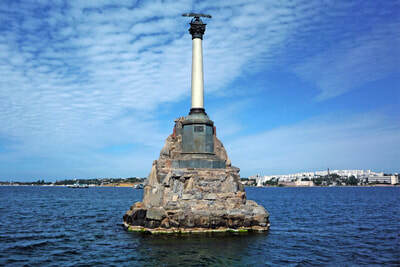 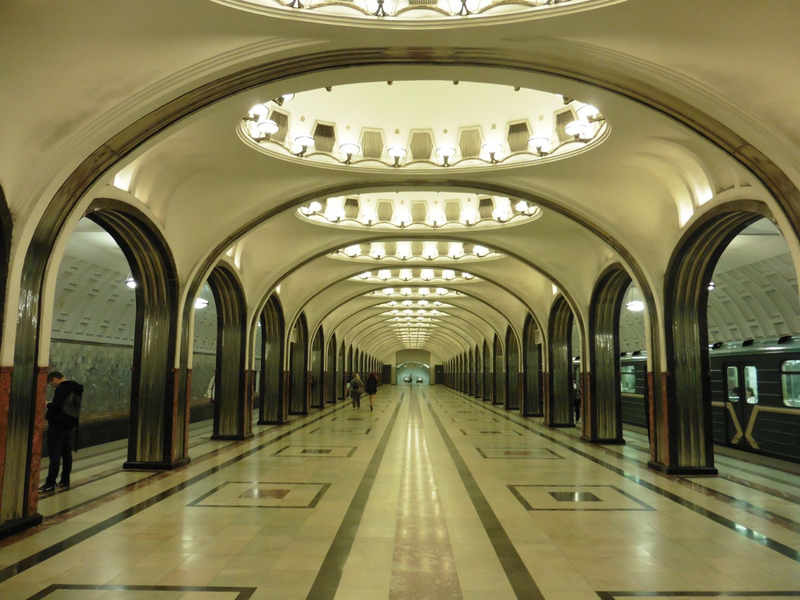 The base remained operational after the collapse of the Soviet Union in 1991 until 1993 when the decommissioning process started, which saw the removal of the warheads and low-yield torpedoes. In 1996, the last Russian submarine left the base, since which time it has been open to the public as the Naval museum complex Balaklava. 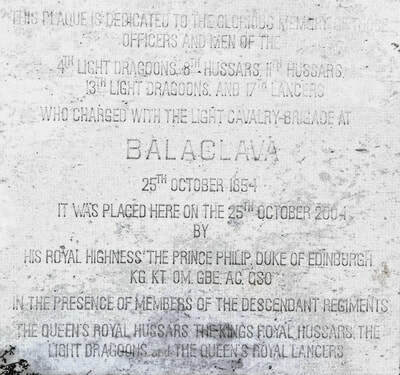 Balaklava is perhaps most well known for the Battle of Balaclava during the Crimean War (1853 to 1856) and the infamous Charge of the Light Brigade, where a British cavalry charge, due to a misunderstanding, were sent up a valley strongly held on three sides by Russian forces. Approximately 250 men were killed or wounded, and over 400 horses lost, in the charge, which effectively reduced the size of the mounted brigade by two thirds and destroyed some of the finest light cavalry in the world to no military purpose. 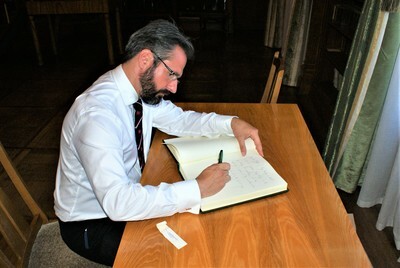 The British poet Alfred, Lord Tennyson immortalised the battle in verse in his famous Charge of the Light Brigade. 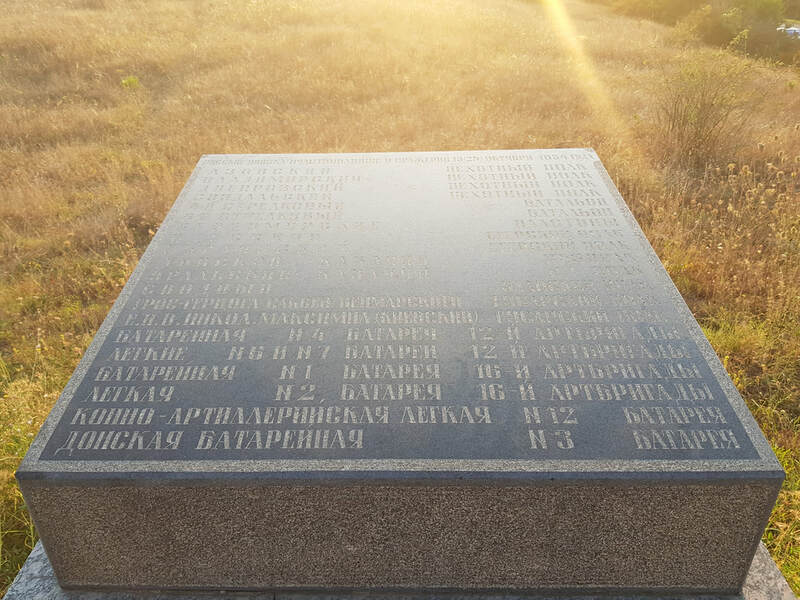 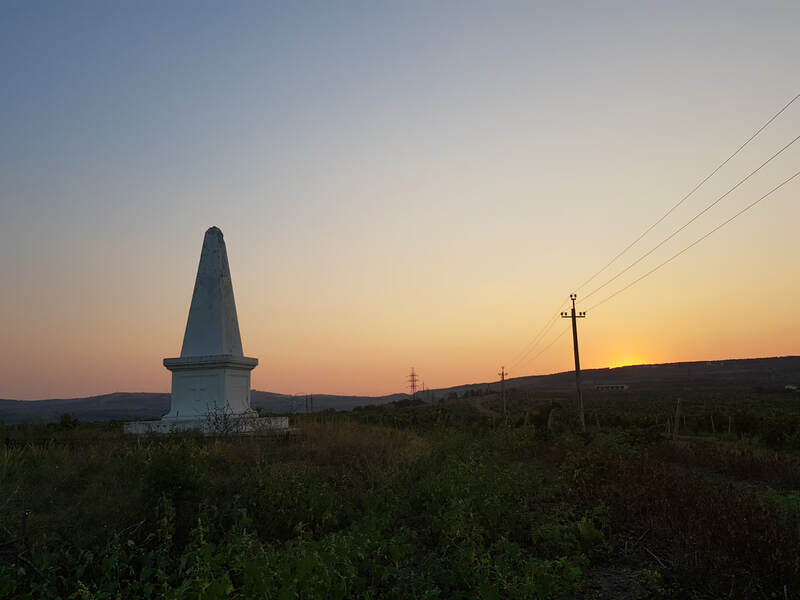 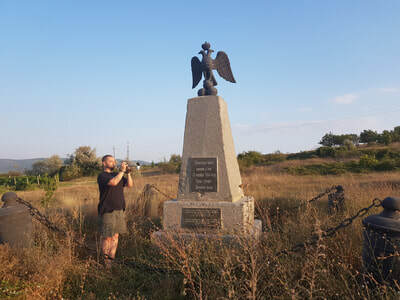 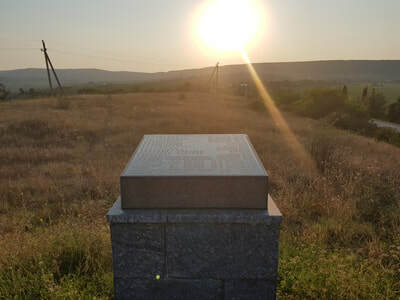 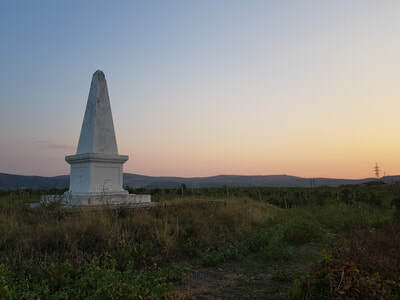 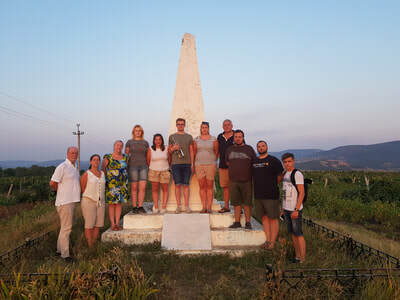 ​We visited the field of the battle, and also both the Russian and British Memorials. 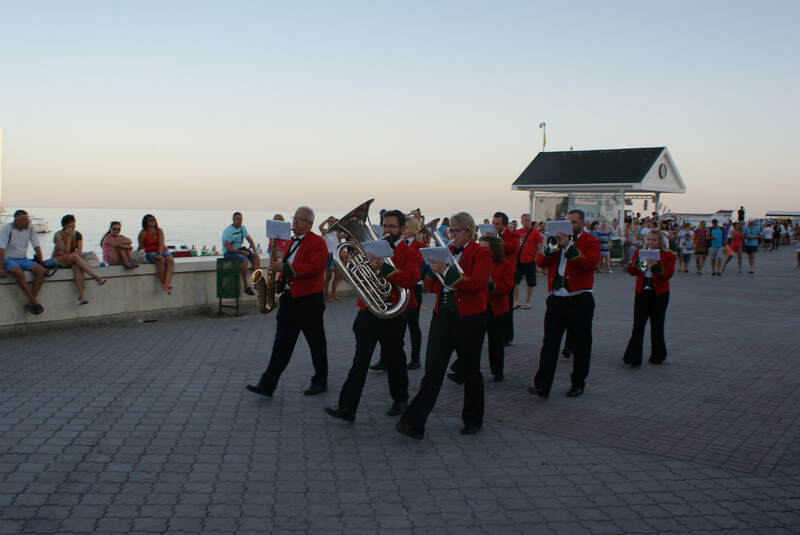 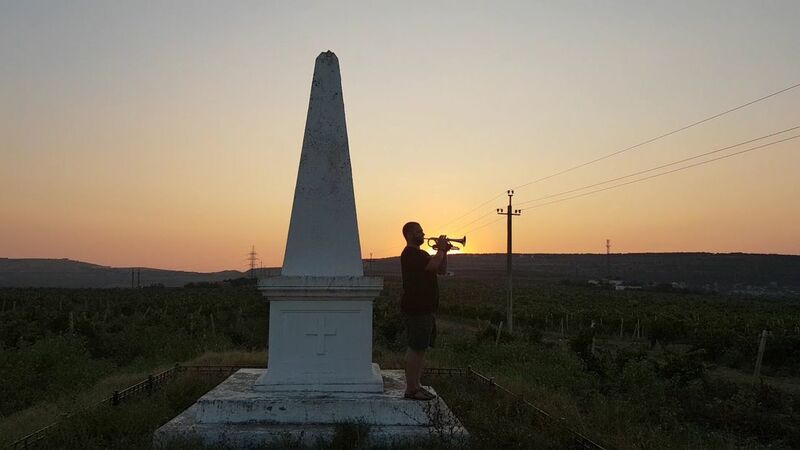 We're proud that two of our musicians could perform the Last Post and Reveille there at sunset. 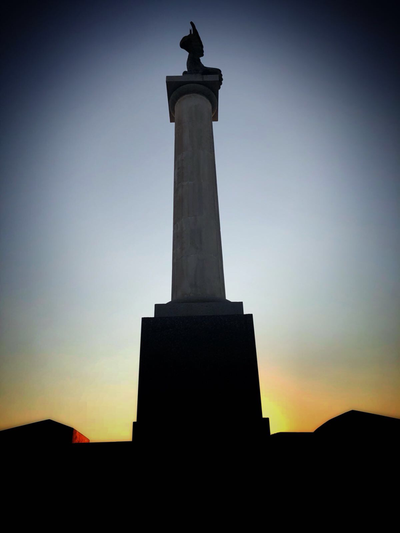 The British memorial is quite inaccessible (we had to cross both a main road and train tracks to find and access it) and is in need of some maintenance (the inscription states it was last renovated during a visit by HRH Prince Philip, The Duke of Edinburgh in 2004). 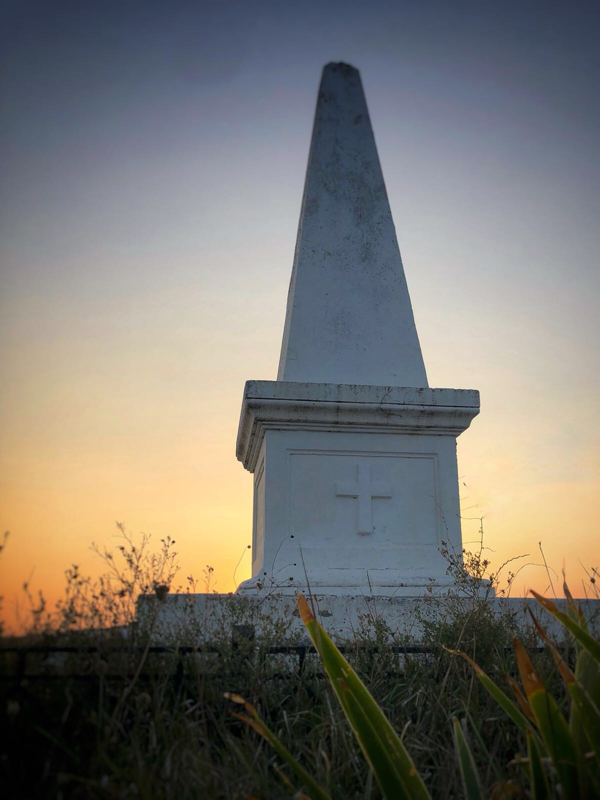 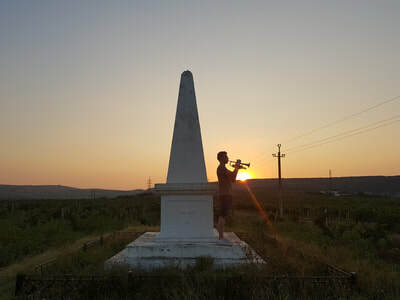 SBW are thankful to our Russian hosts for enabling us to visit the Memorial and will work with them to attempt to see the Memorial further restored ahead of the 165th anniversary of the Battle in 2019.